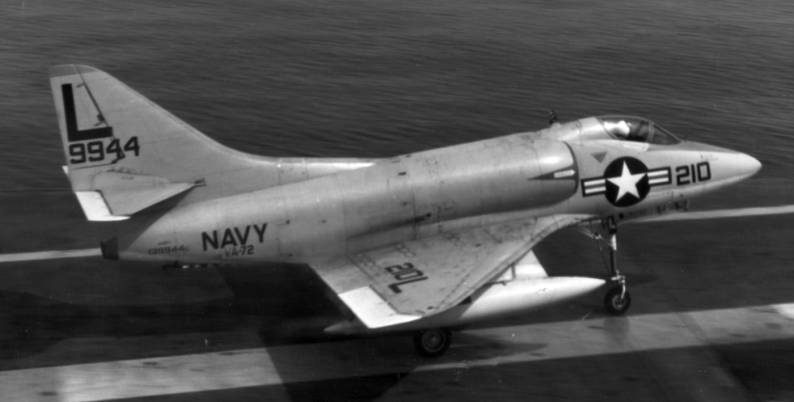 Sep-Dec 1946: Participated in USS Leyte (CV-32) shakedown cruise in the Caribbean Sea and a goodwill cruise to South America for the inauguration of Chile’s President Gabriel González Videla. 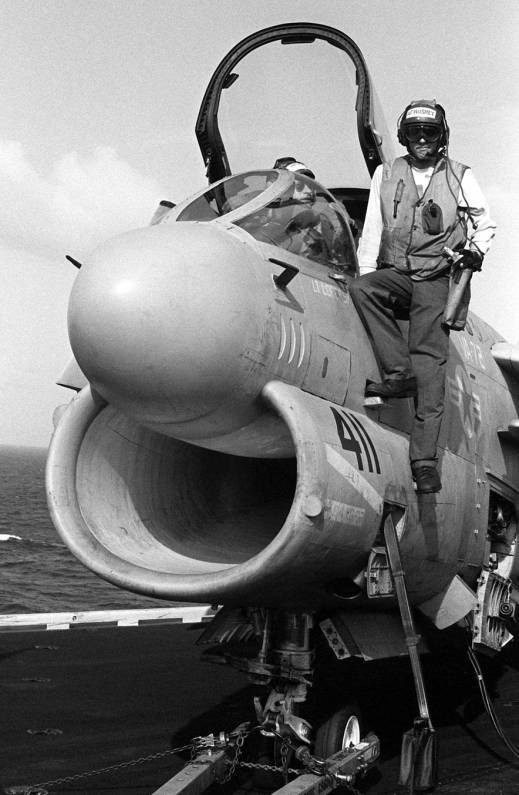 19 Aug 1948: Squadron commanding officer, Lieutenant Commander B. F. Haker, lost at sea while attempting a carrier approach. 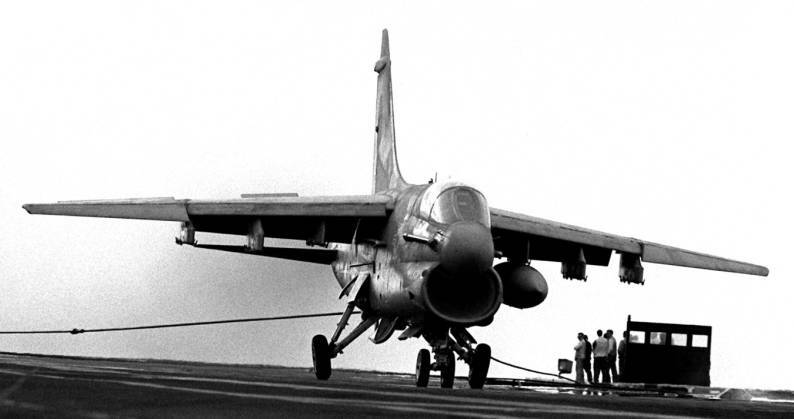 25 Jan 1949: Cross deck operations with the British carrier HMS Triumph (R16) in the Mediterranean. 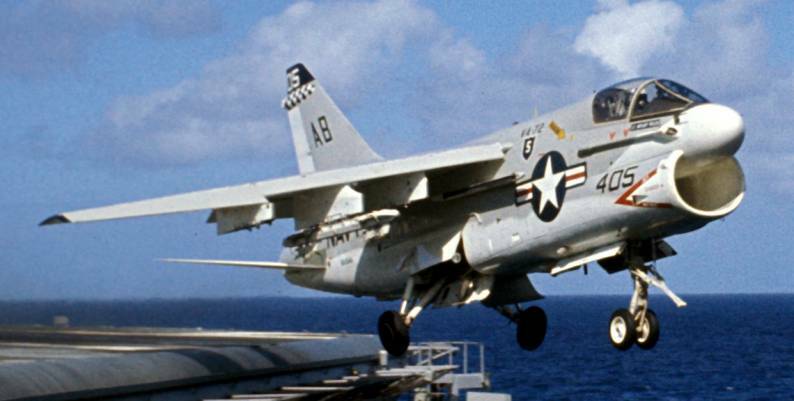 Apr 1961: The squadron operated from USS Independence (CVA-62) in an area south of Guantanamo Bay, Cuba, during the Bay of Pigs Invasion, the unsuccessful invasion of Cuba by American supported Cuban exiles. 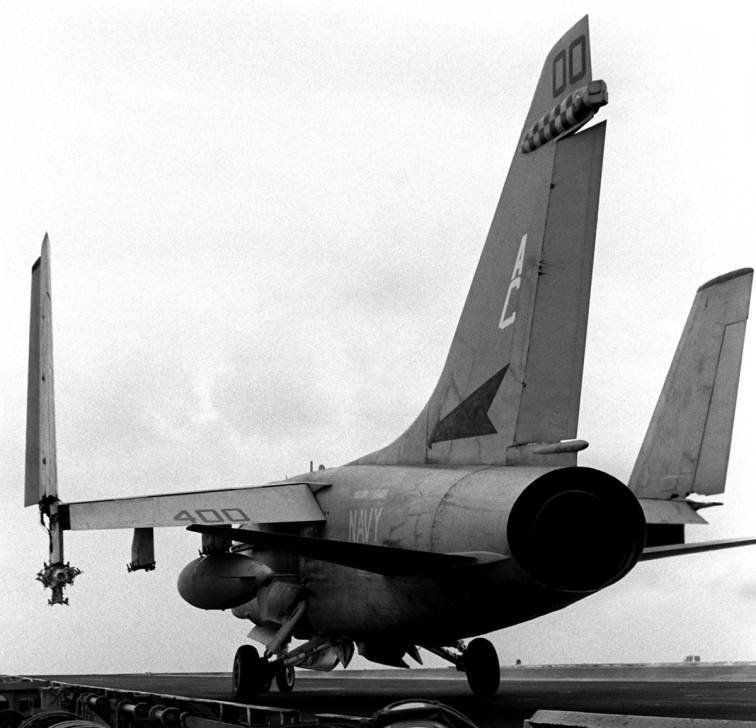 22 Oct-22 Nov 1962: Participated in the Cuban Quarantine while embarked in Independence. 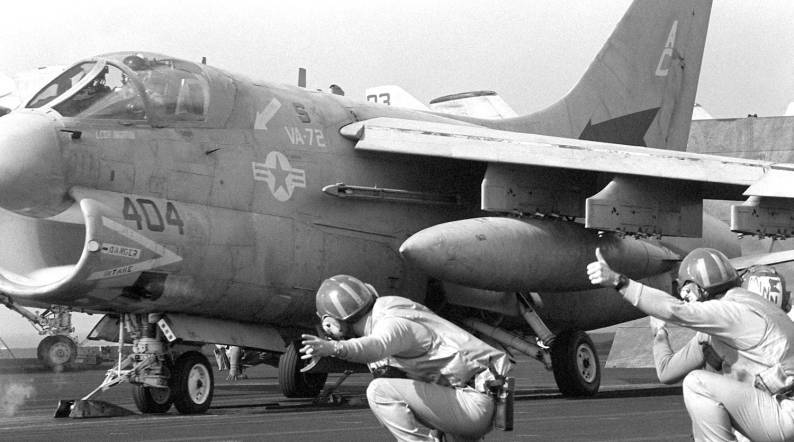 10-16 May 1963: A detachment of three aircraft deployed in USS Wasp (CVS-18) to provide courier service during a Project Mercury space flight of the Faith 7 capsule. 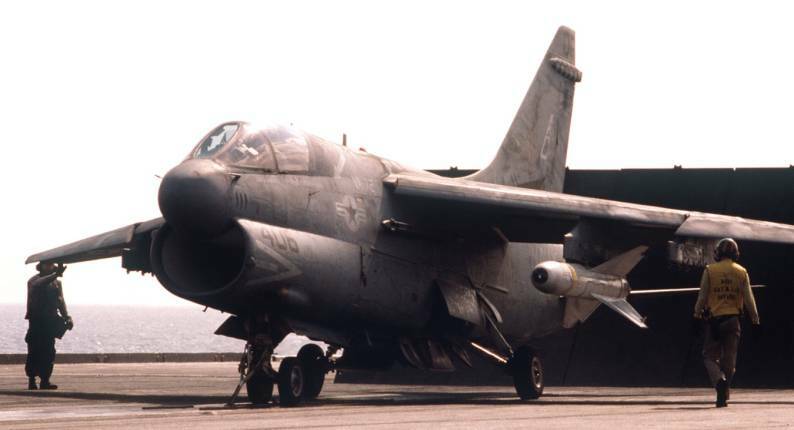 17 Oct 1965: The squadron’s executive officer, Commander H. B. Southworth, led the first successful strike against a surface-to-air SA-2 missile installation in North Vietnam. 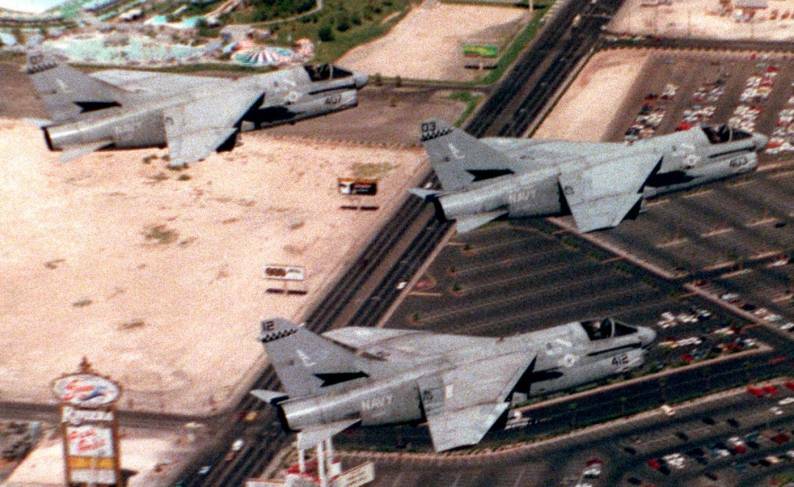 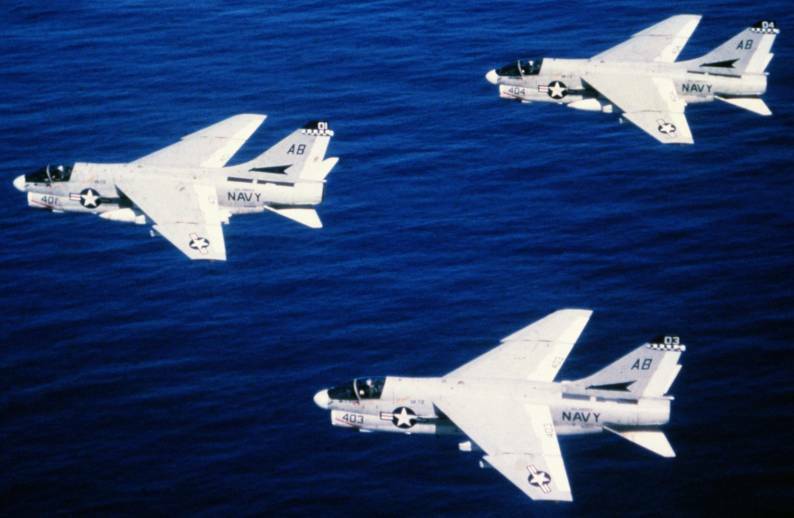 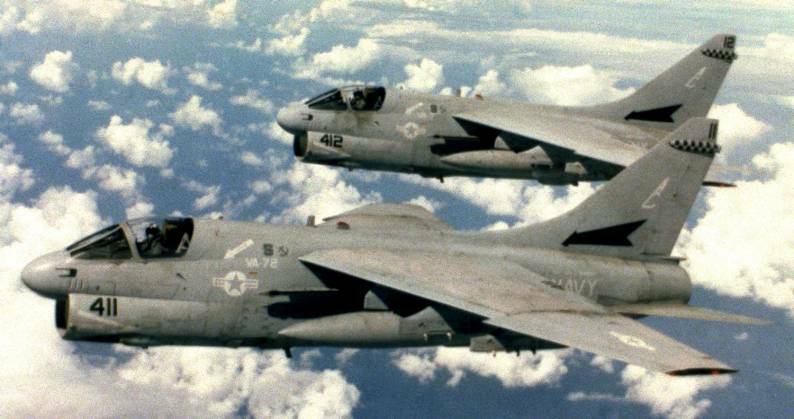 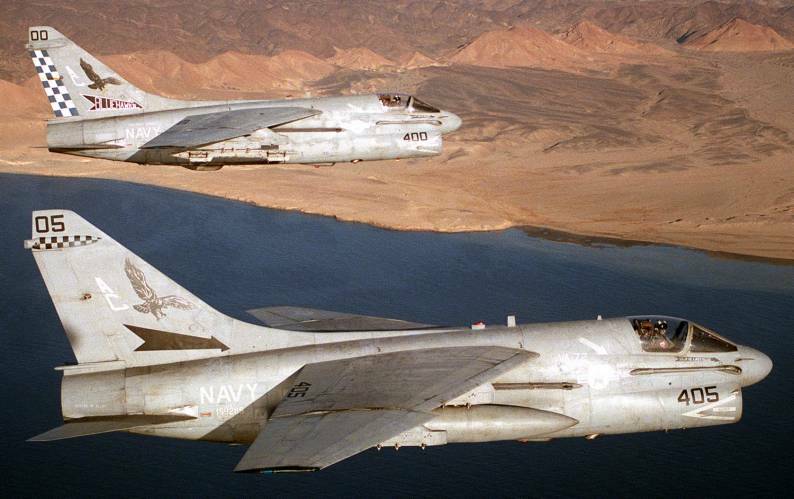 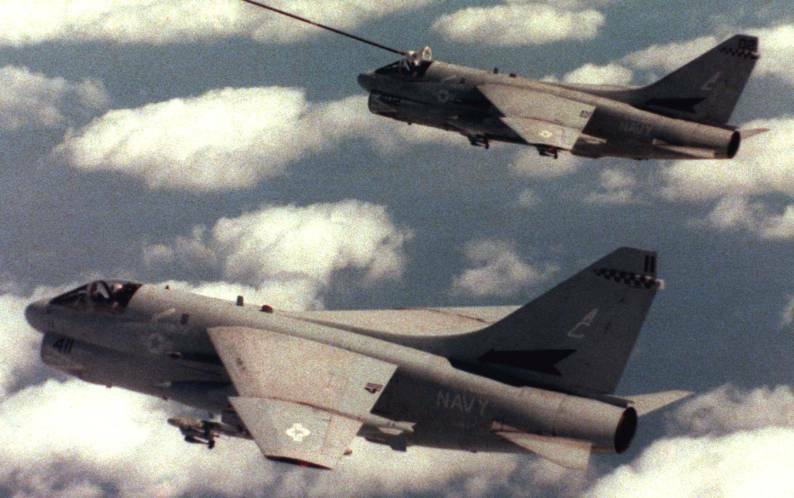 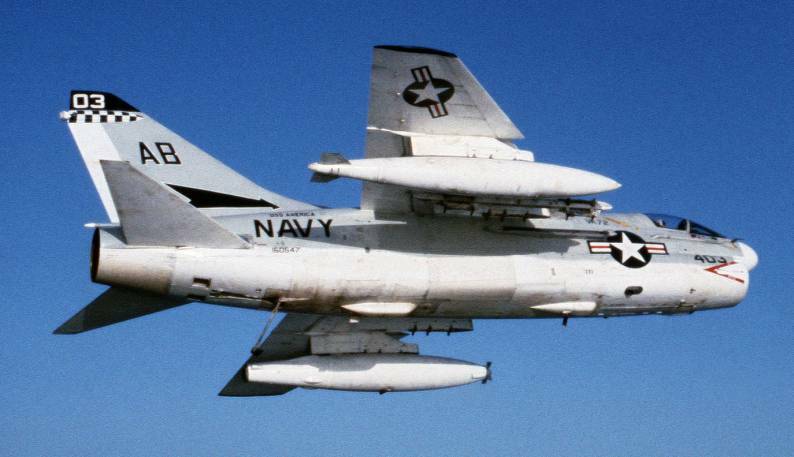 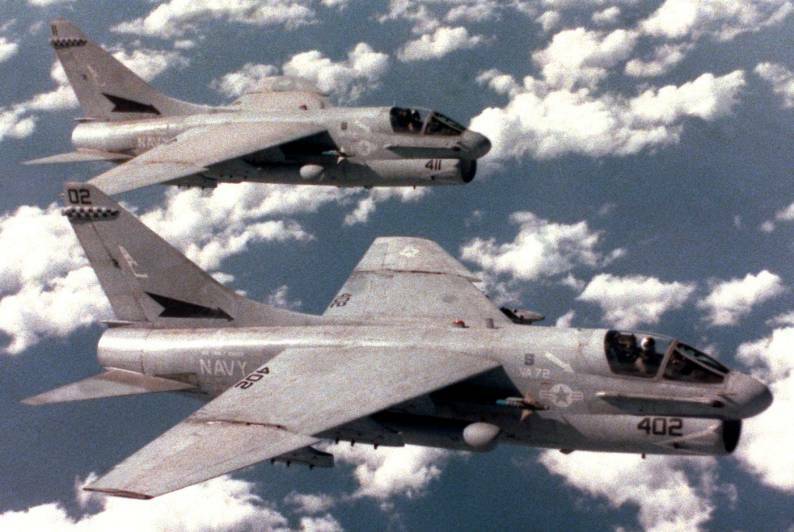 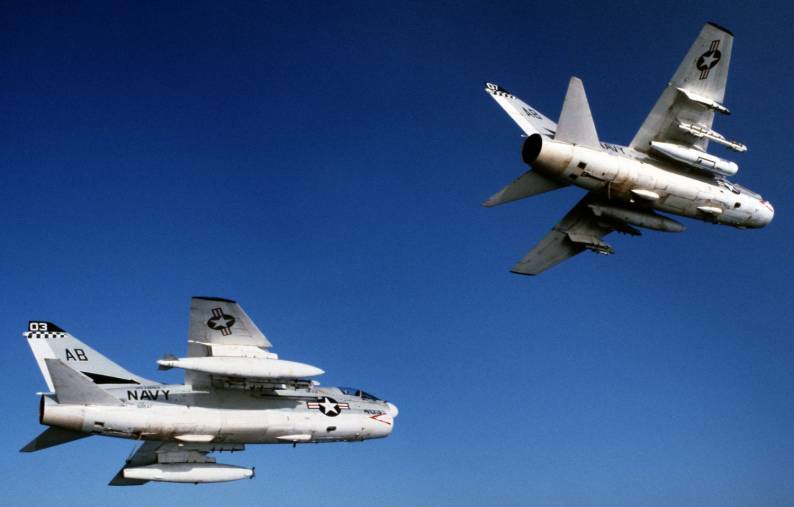 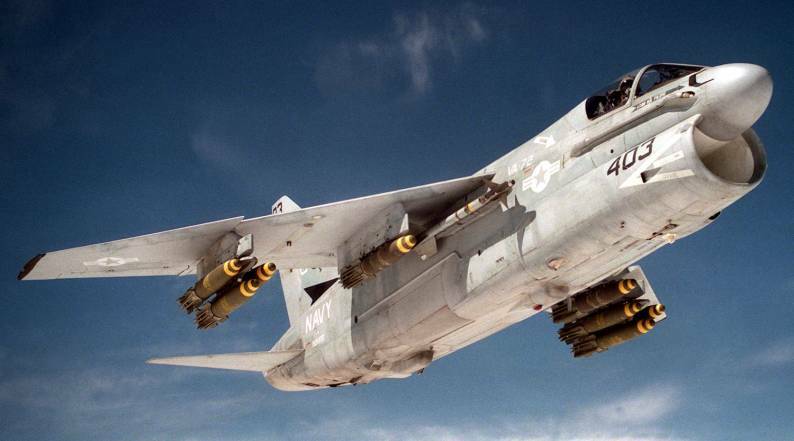 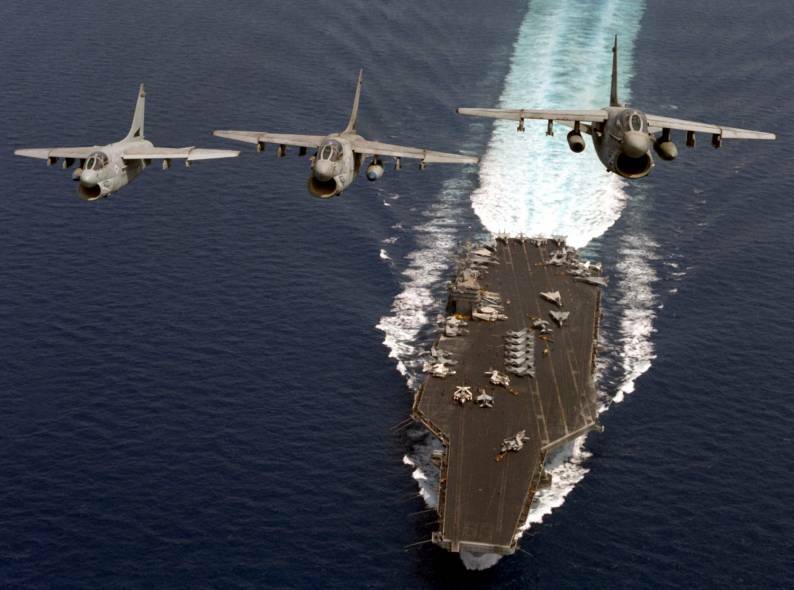 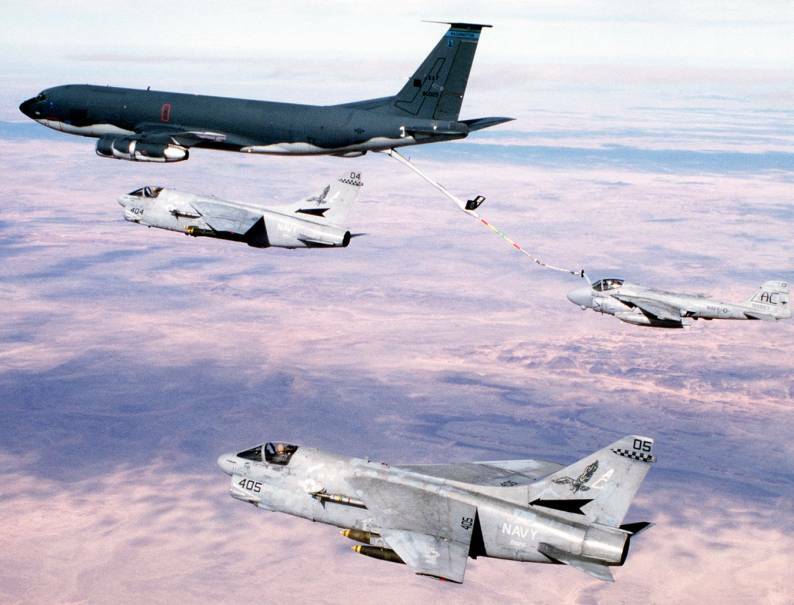 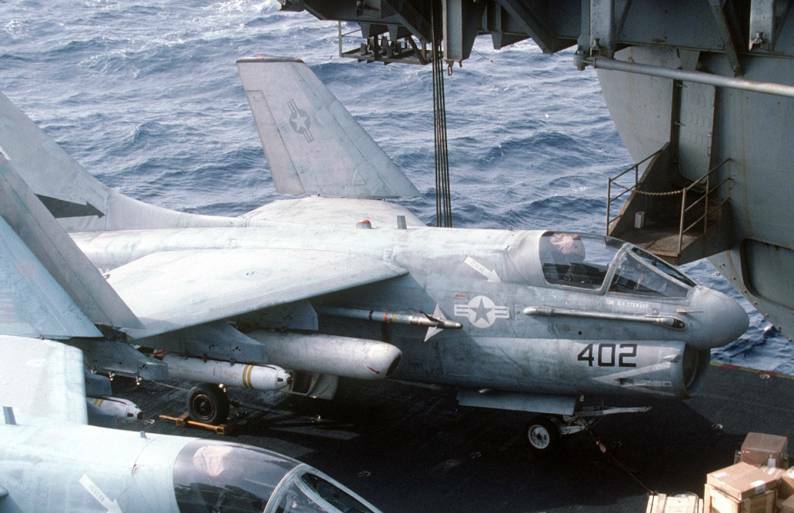 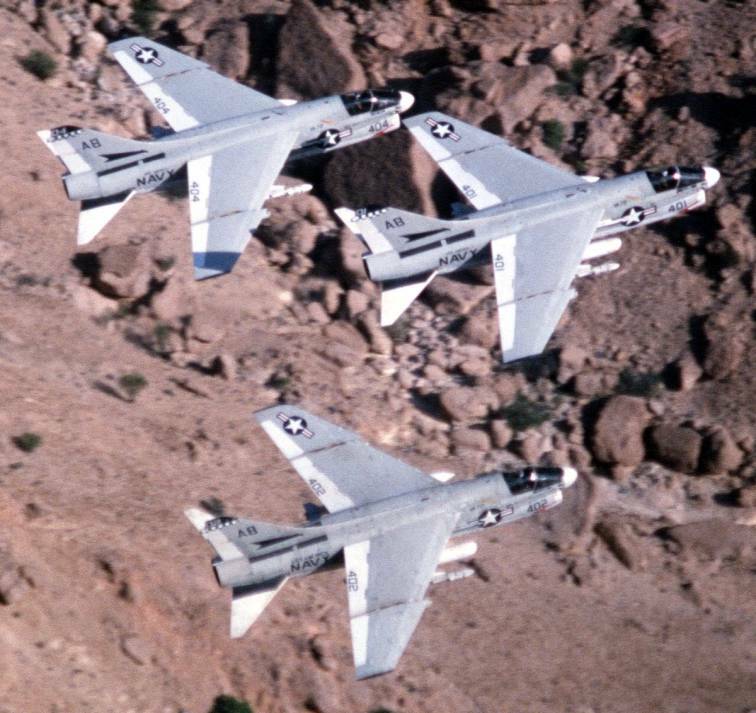 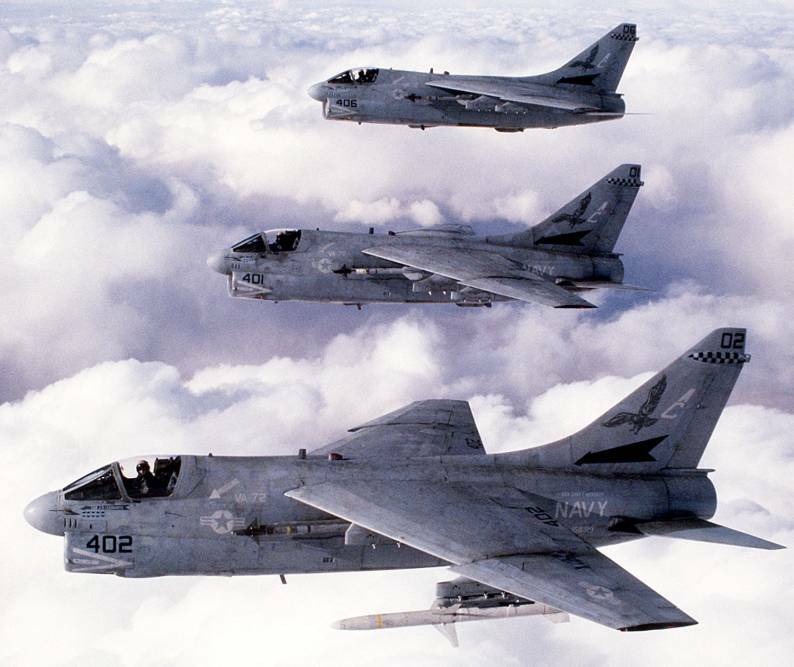 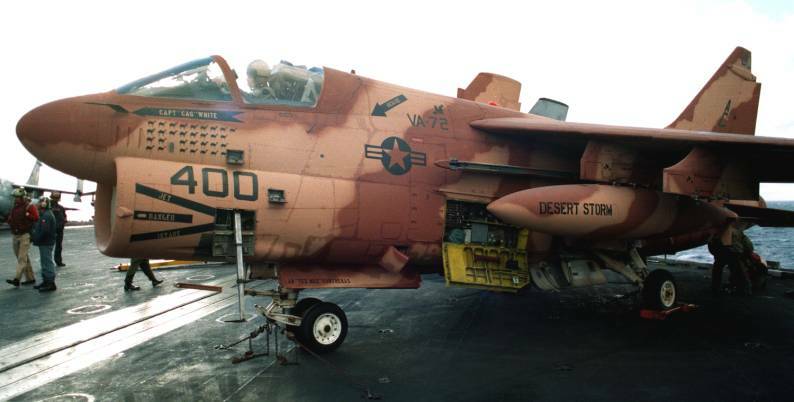 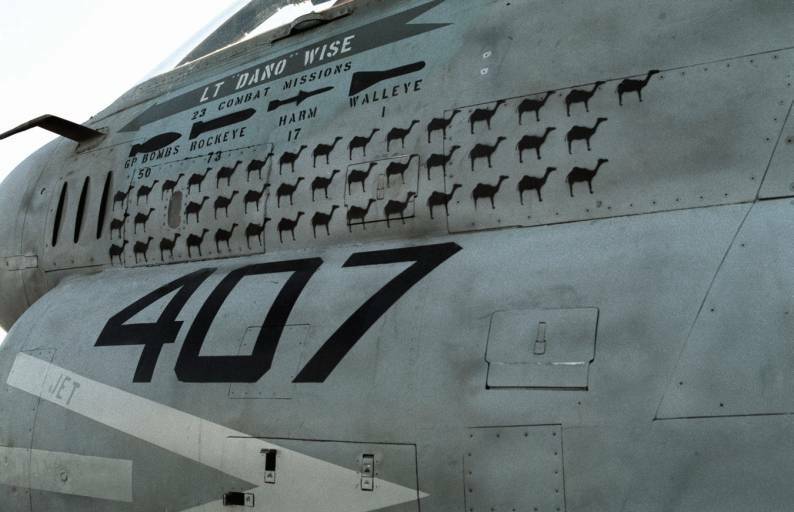 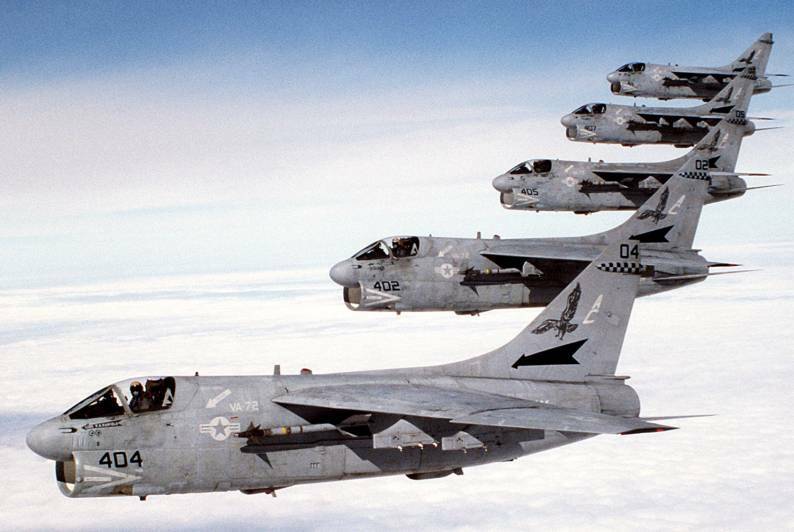 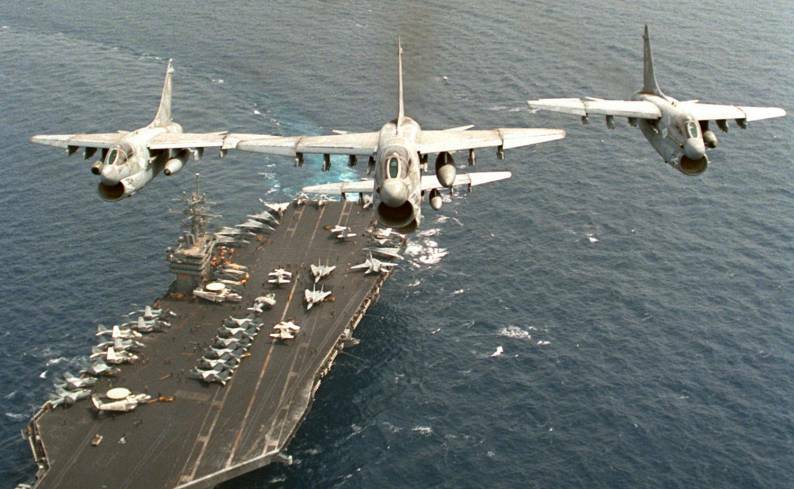 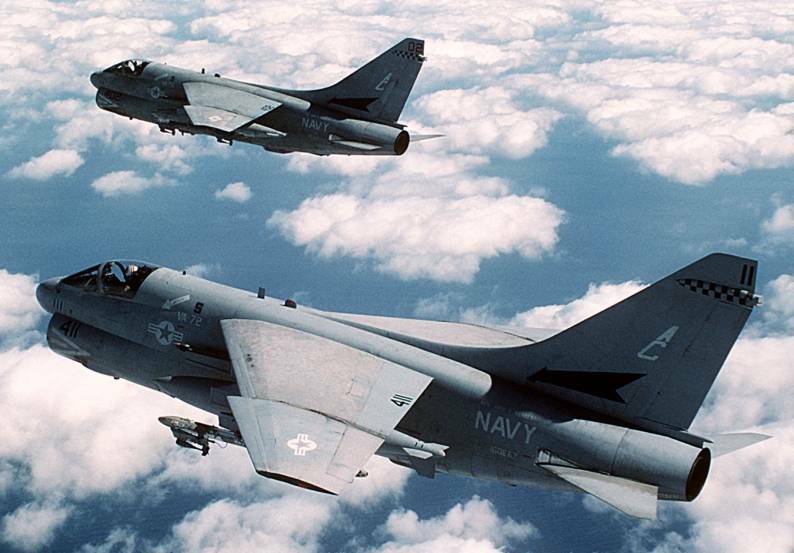 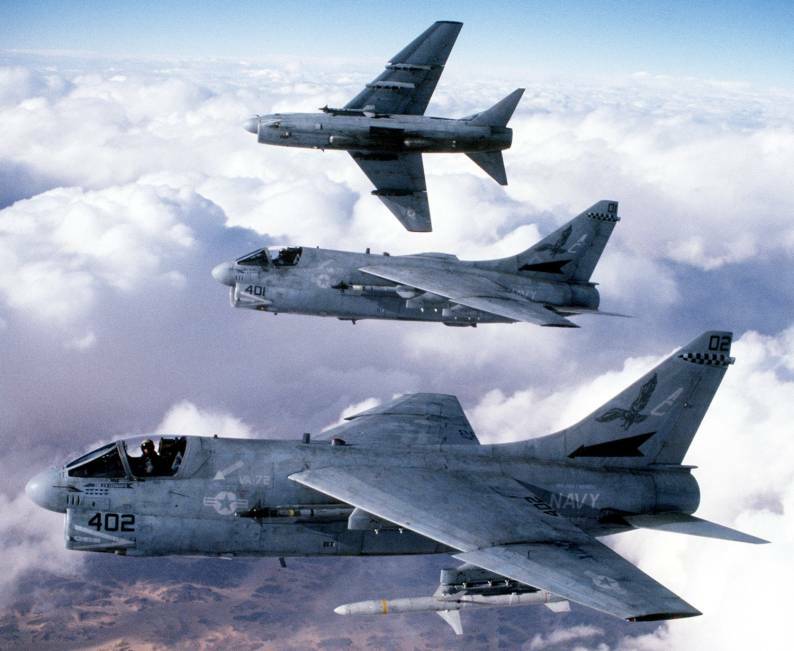 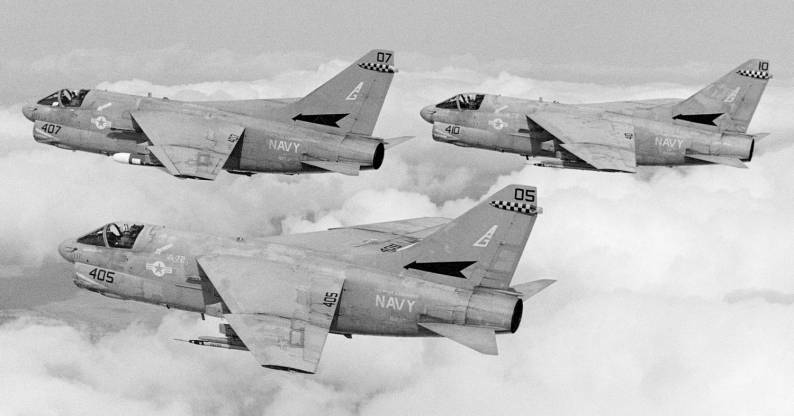 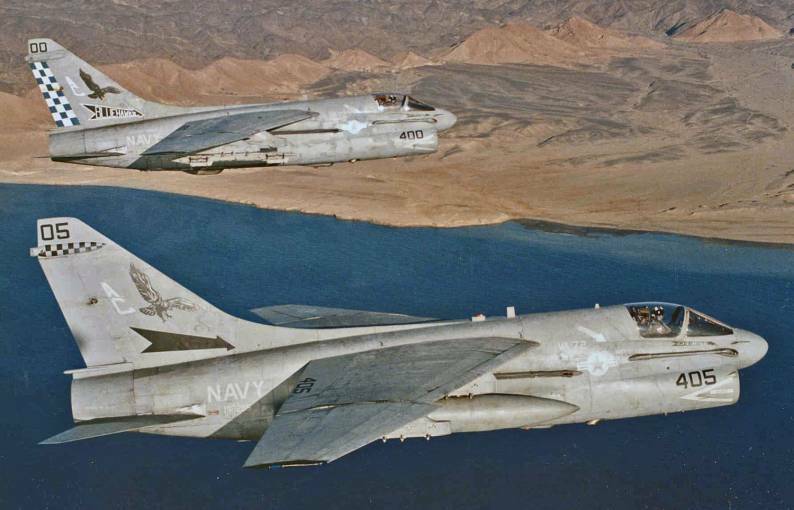 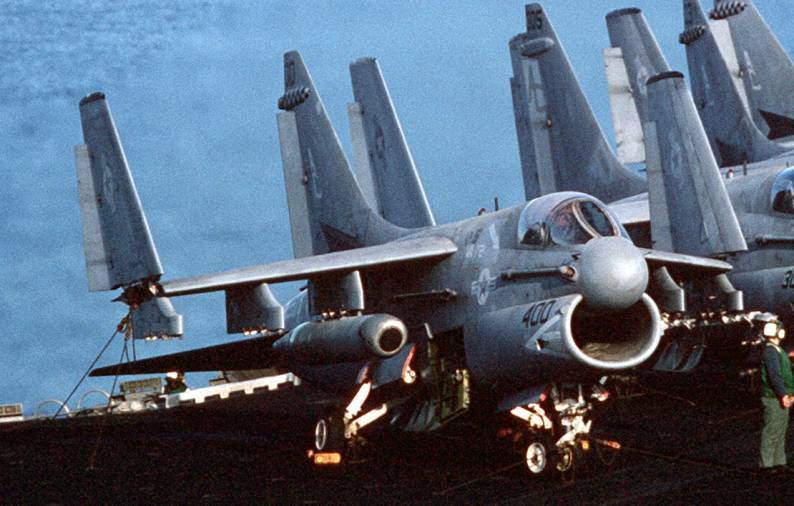 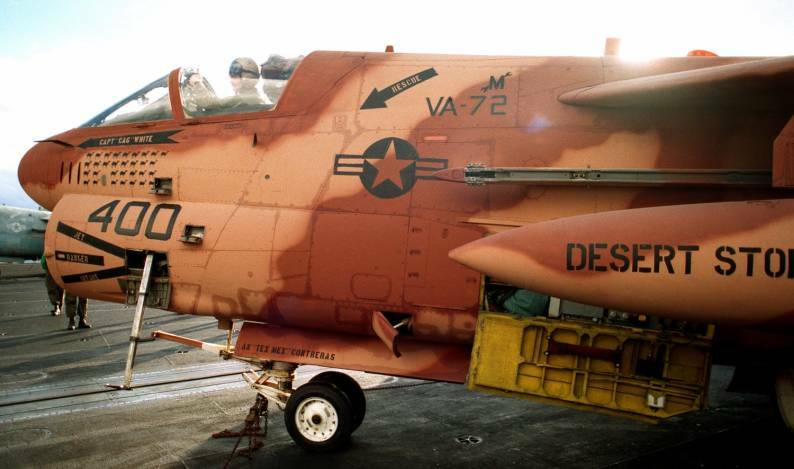 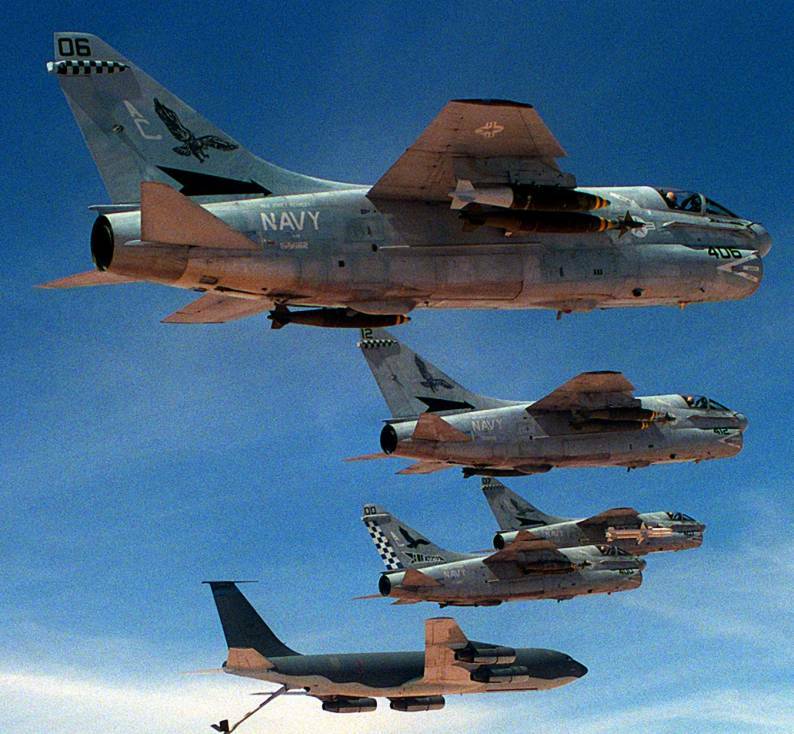 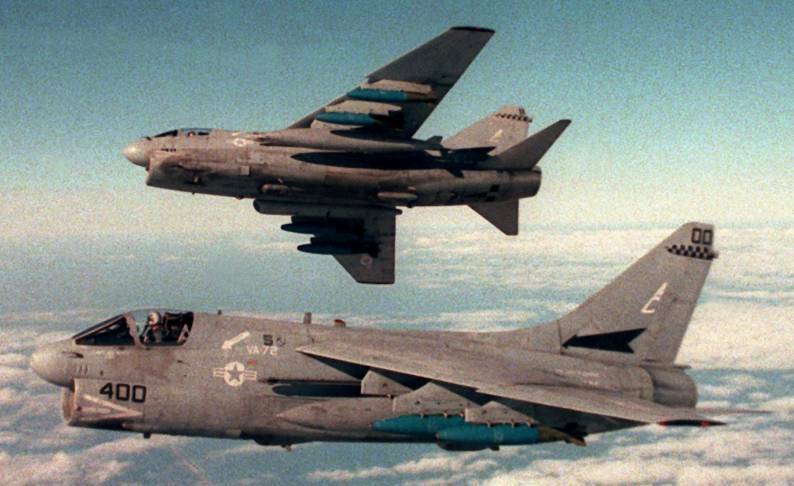 The strike was composed of four VA-72 A-4Es and one A-6A from VA-75. 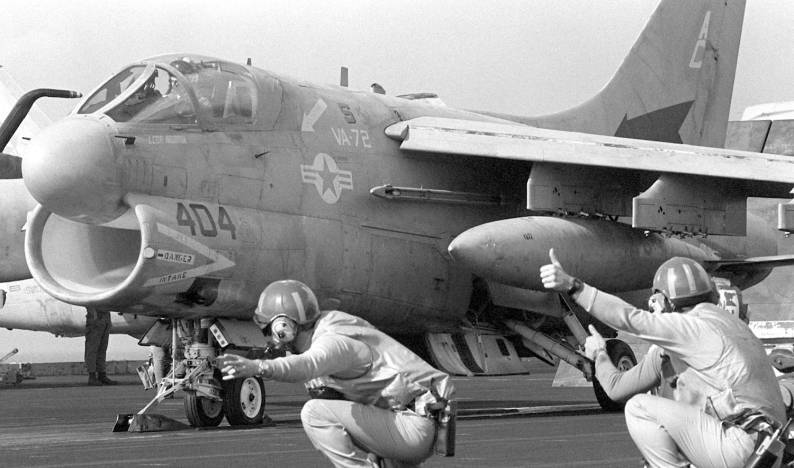 18 Sep 1970: While operating in the Caribbean aboard USS John F. Kennedy (CVA-67), the squadron was ordered to deploy with the carrier to the Mediterranean due to the fighting between forces of Jordan and Palestine and the intervention of Syria on behalf of the Palestinians. 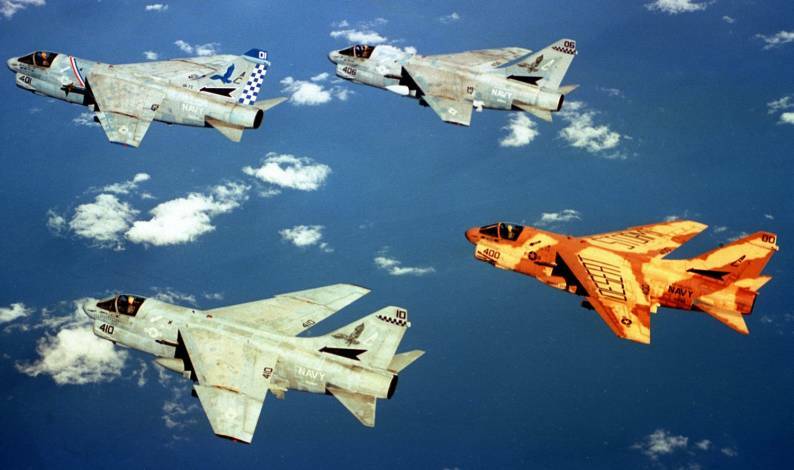 Oct 1973: With the outbreak of the Yom Kippur War, Kennedy and her air wing, while operating in the North Atlantic after just completing a Mediterranean deployment, were ordered back to the Mediterranean. 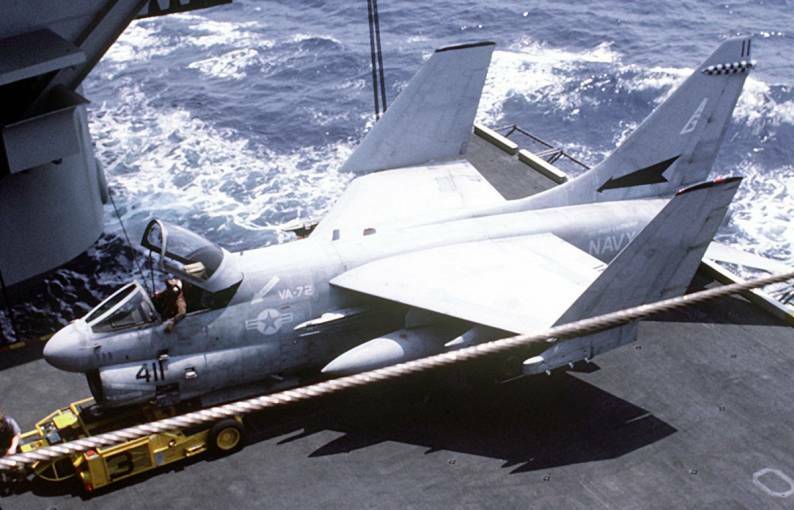 VA-72 conducted flight operations while the carrier was on station south of Crete, from the latter part of October through mid November. 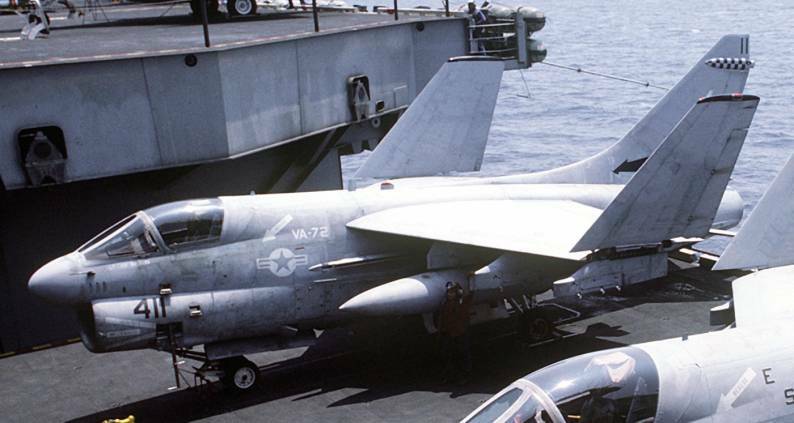 17-19 Sep 1985: VA-72, along with other units of CVW-1, were the first to conduct flight operations from a carrier operating inside a fjord. 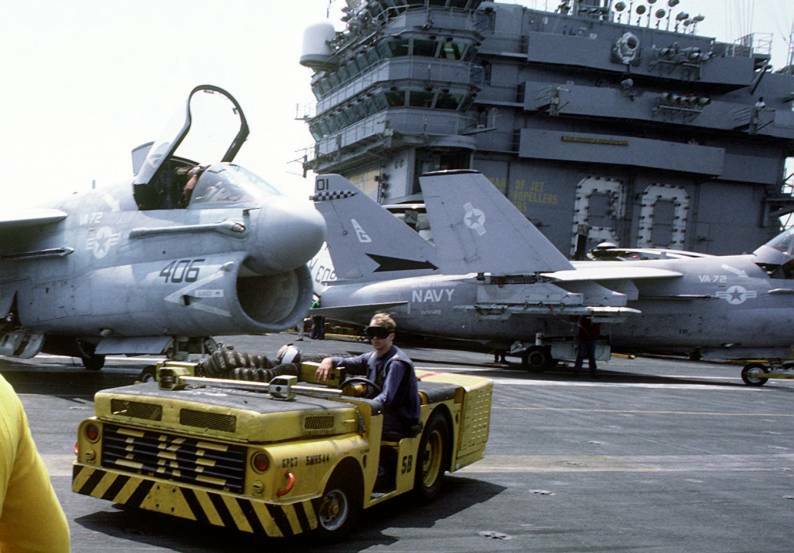 USS America (CV-66) operated in Vestfjord, Norway, during this evolution. 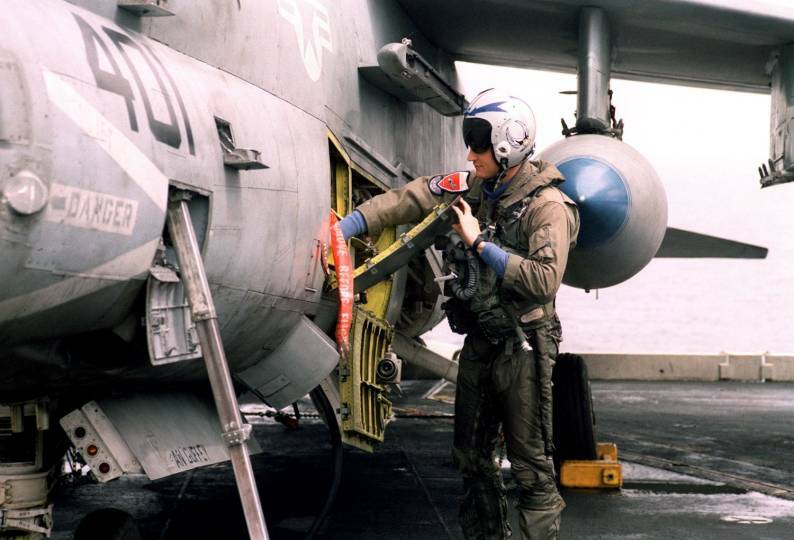 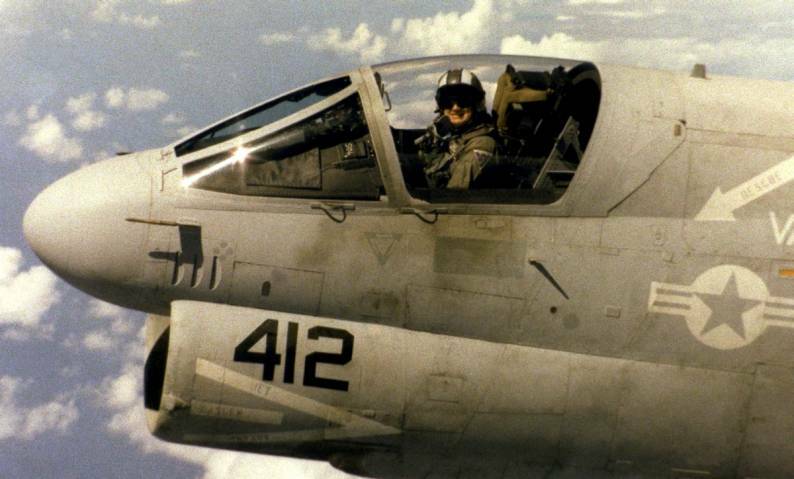 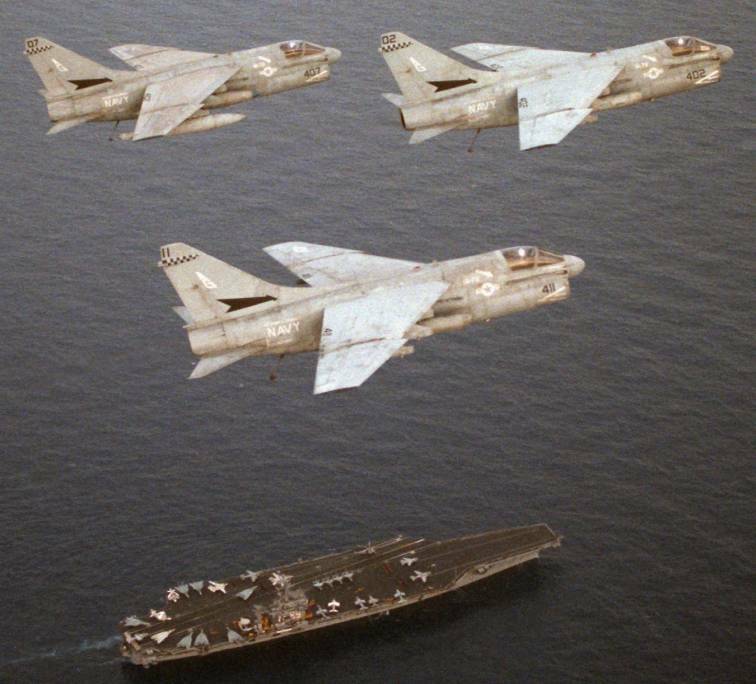 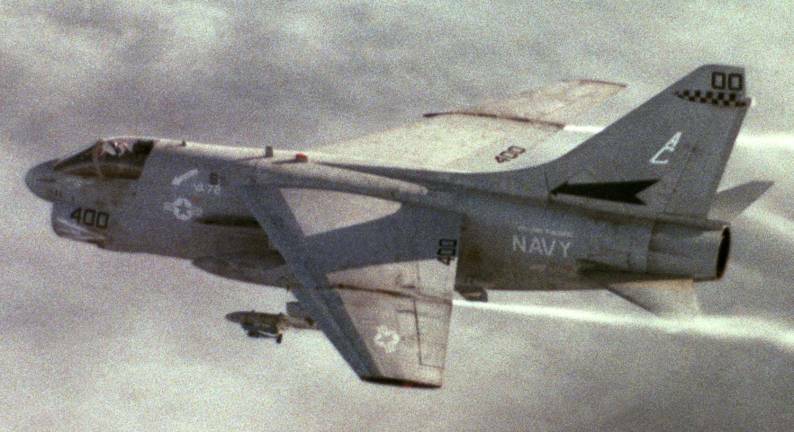 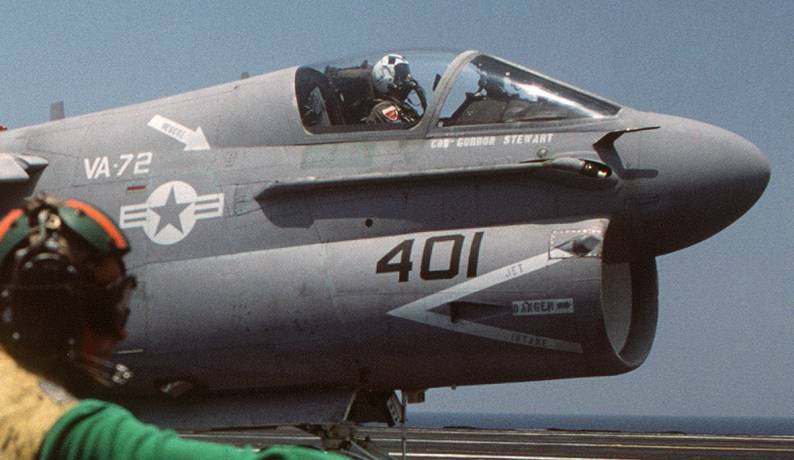 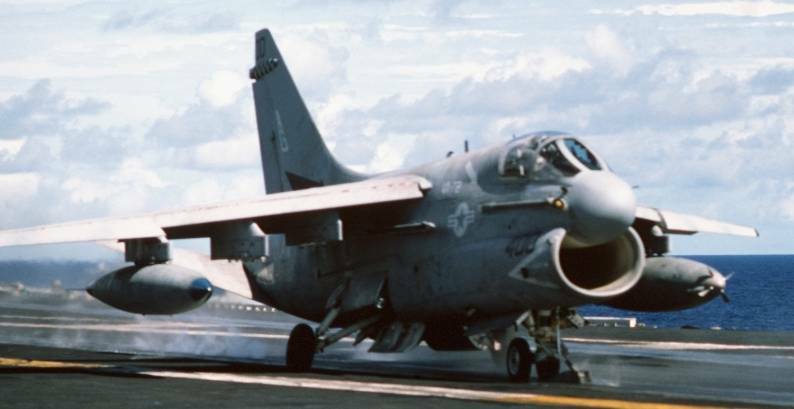 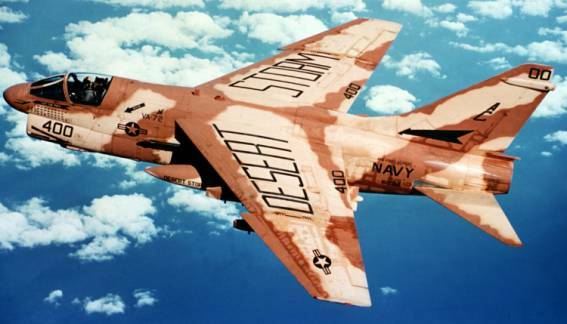 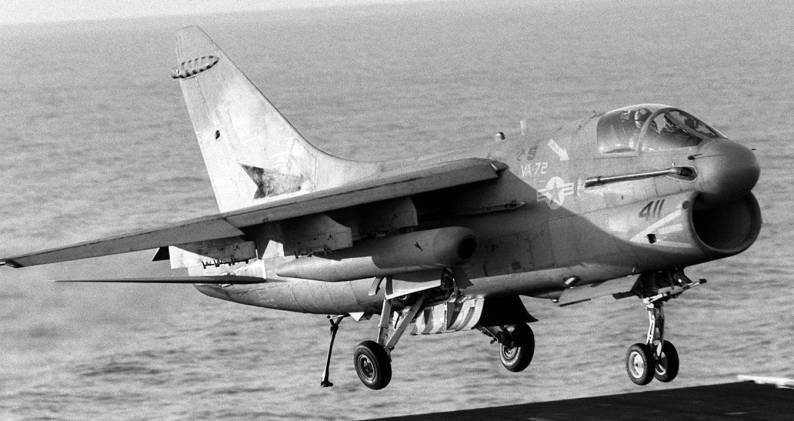 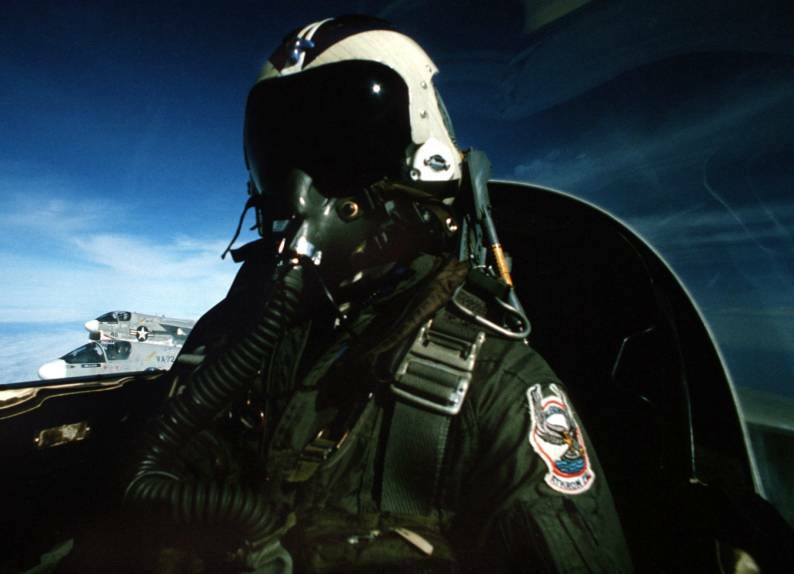 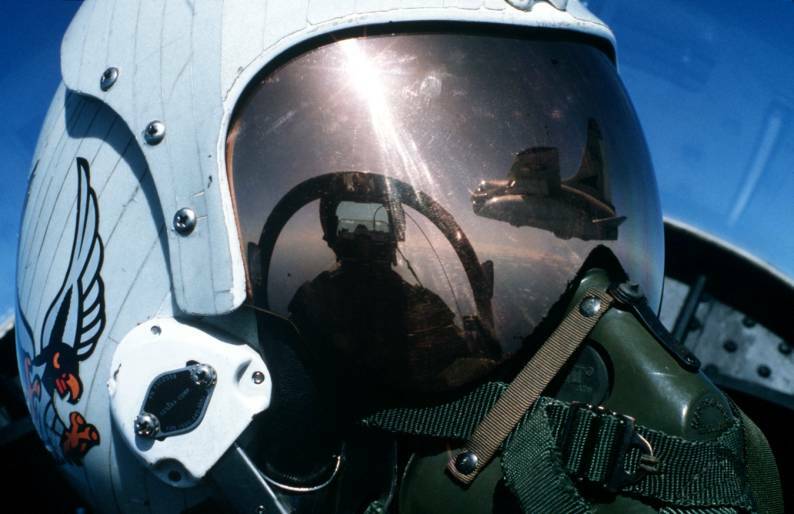 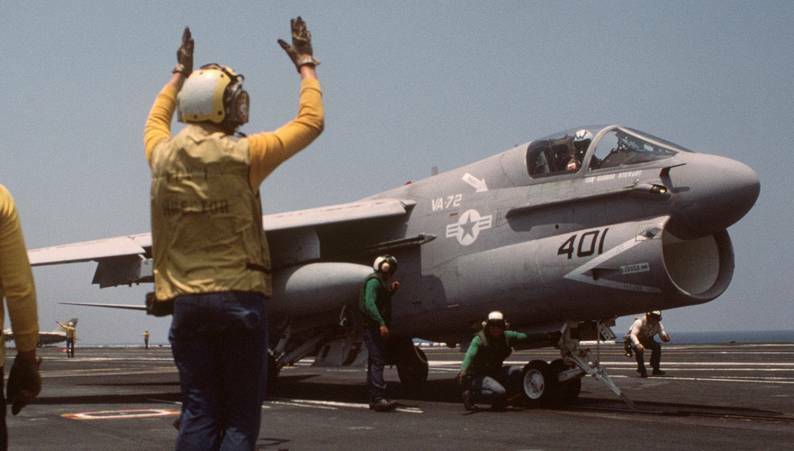 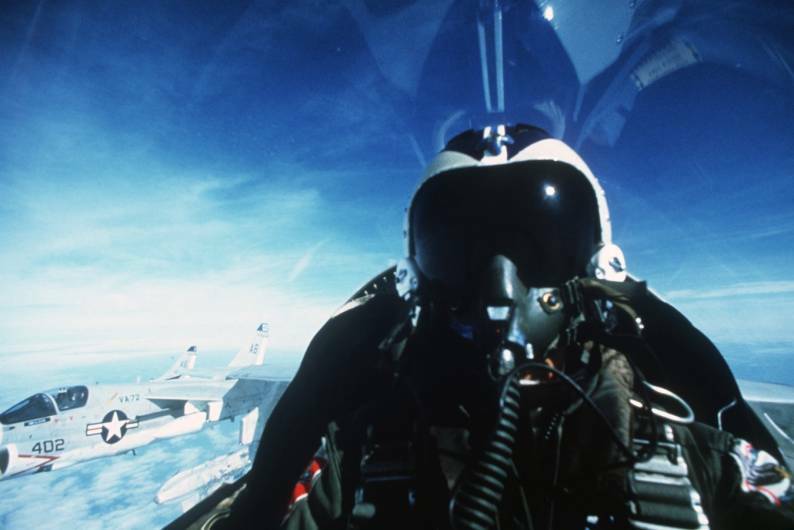 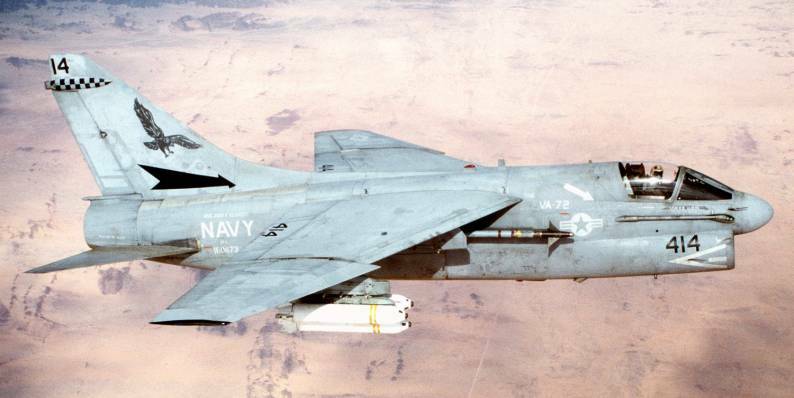 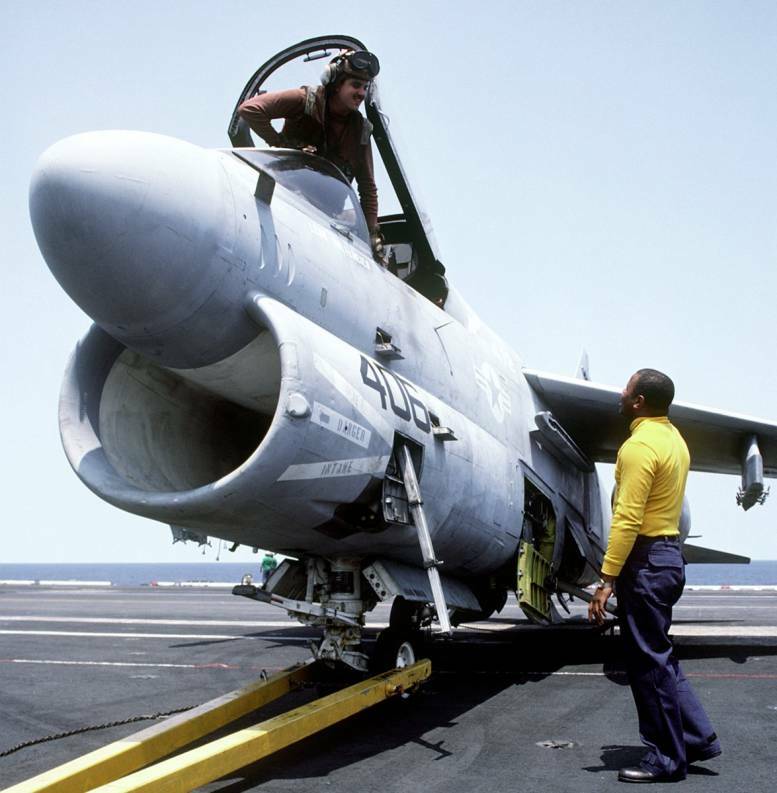 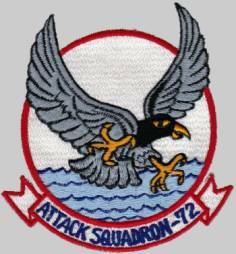 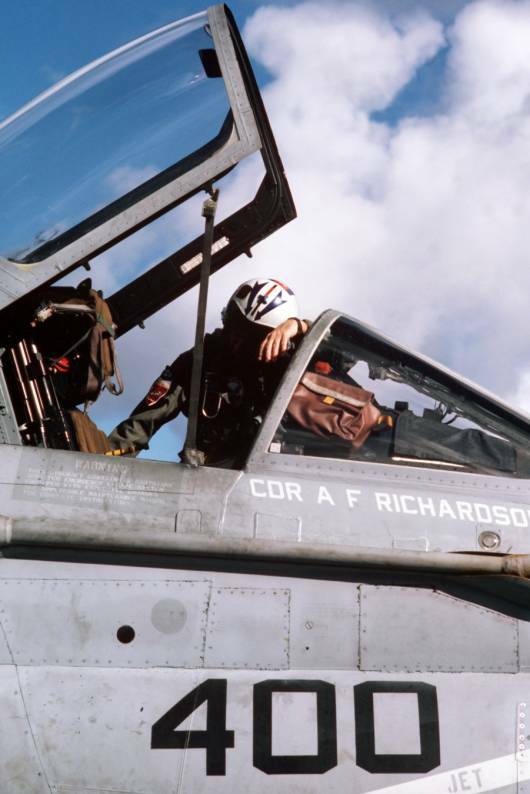 22-27 Mar 1986: During Freedom of Navigation Exercises in the Gulf of Sidra and the resulting combat action with Libyan forces, VA-72 flew patrols to protect the task force from attack by surface ships or submarines and also provided aerial refueling missions for fighters flying combat air patrols. 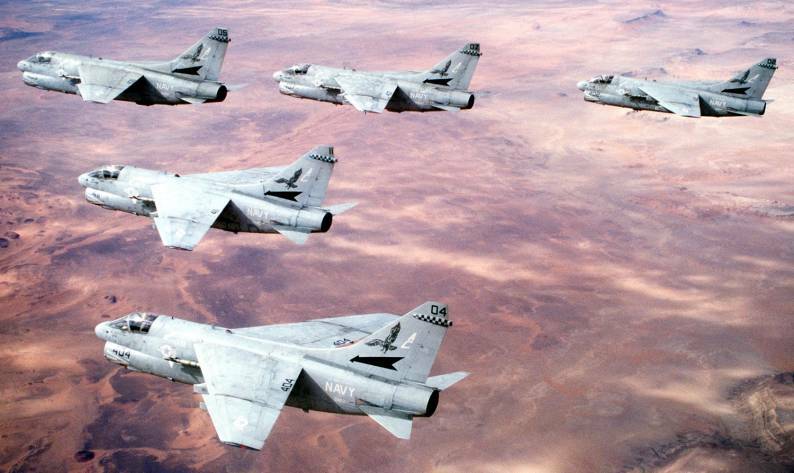 14 Apr 1986: The United States initiated Operation Eldorado Canyon, air strikes against targets in Libya. 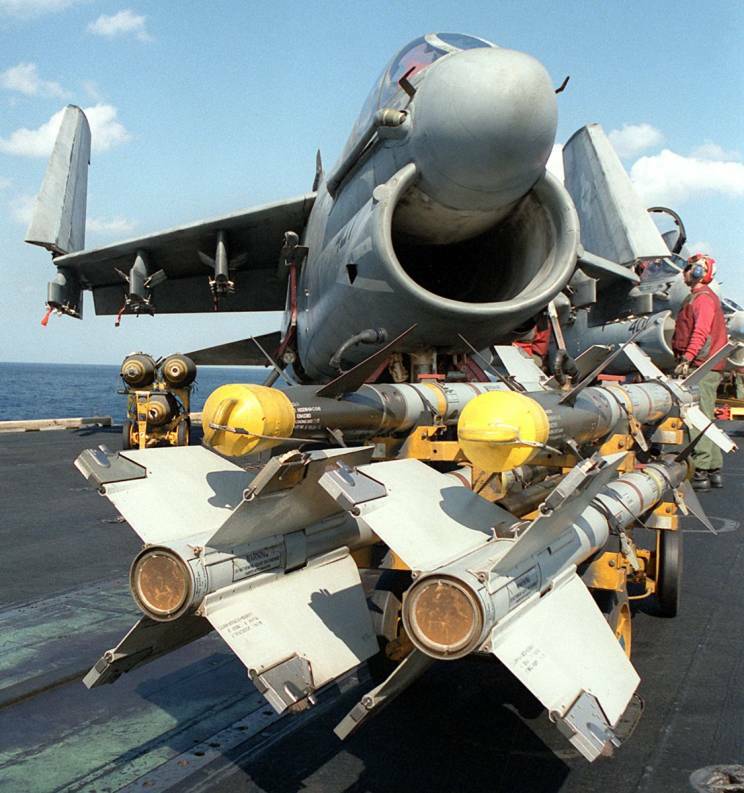 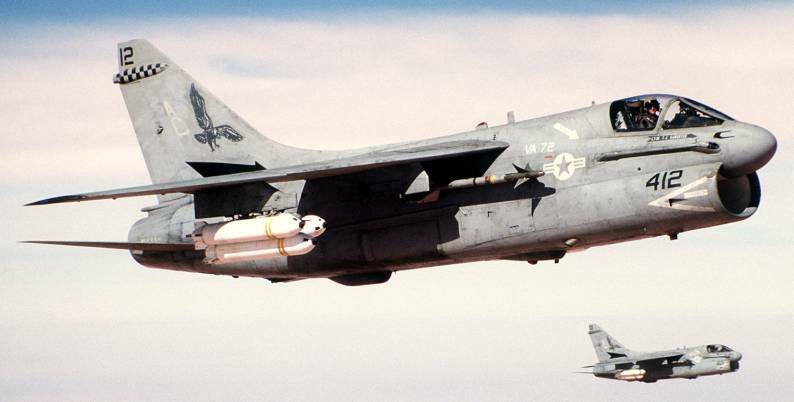 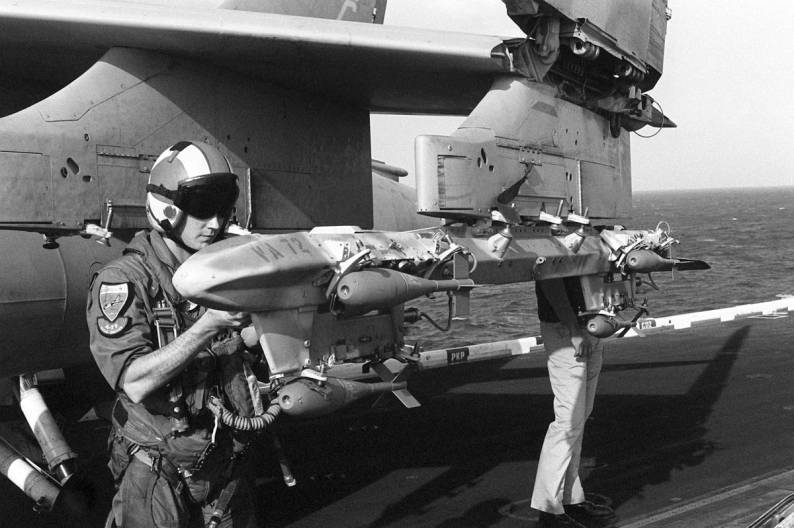 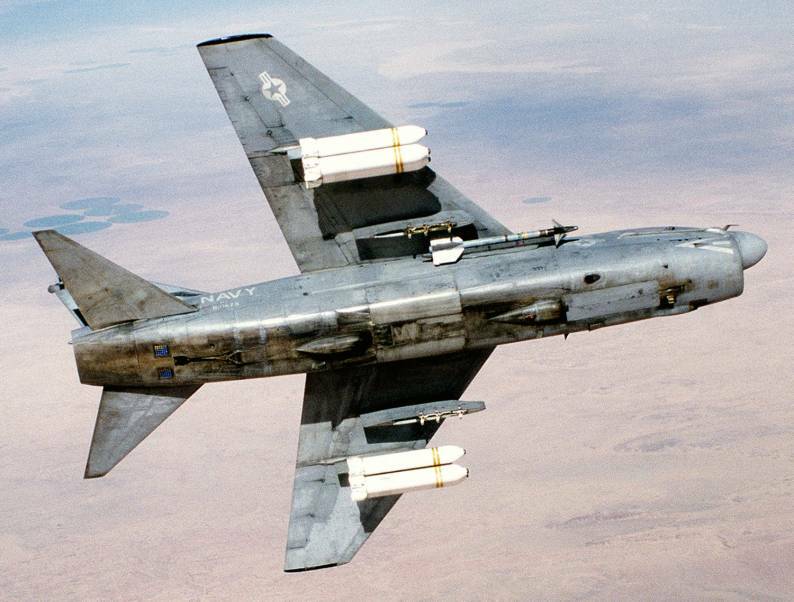 VA-72 provided air-to-surface missile support for possible employment against surface-to-air missile radar sites. 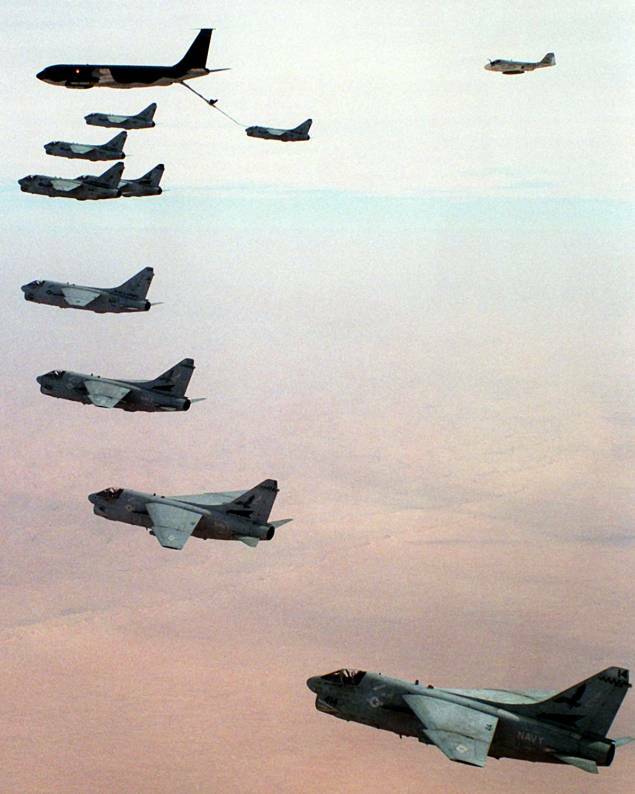 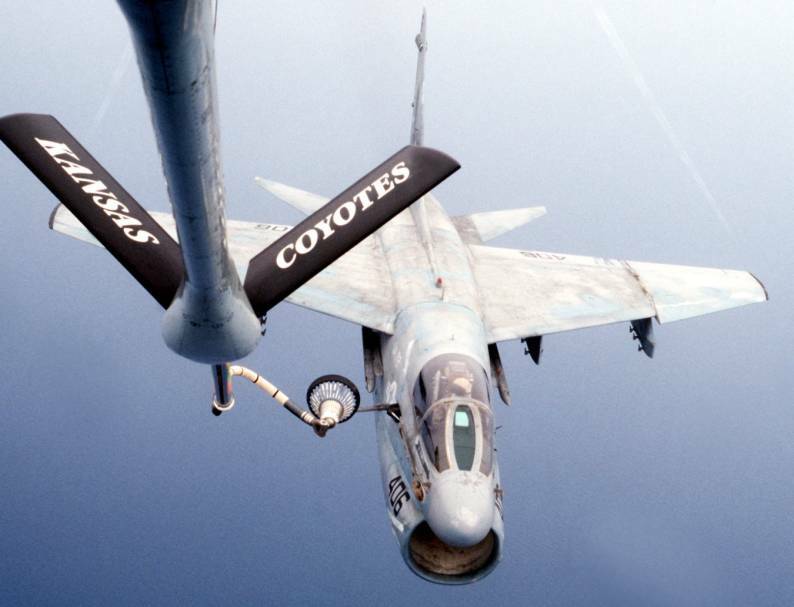 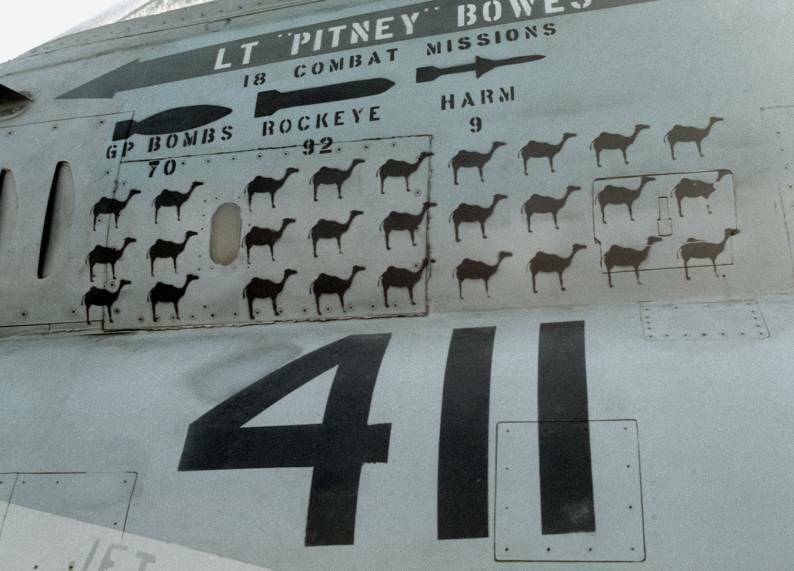 Sep-Oct 1990 and Dec 1990–Jan 1991: The squadron participated in Operation Desert Shield, the build up of American and Allied forces to counter a threatened invasion of Saudi Arabia by Iraq and as part of an economic blockade of Iraq to force its withdrawal from Kuwait. 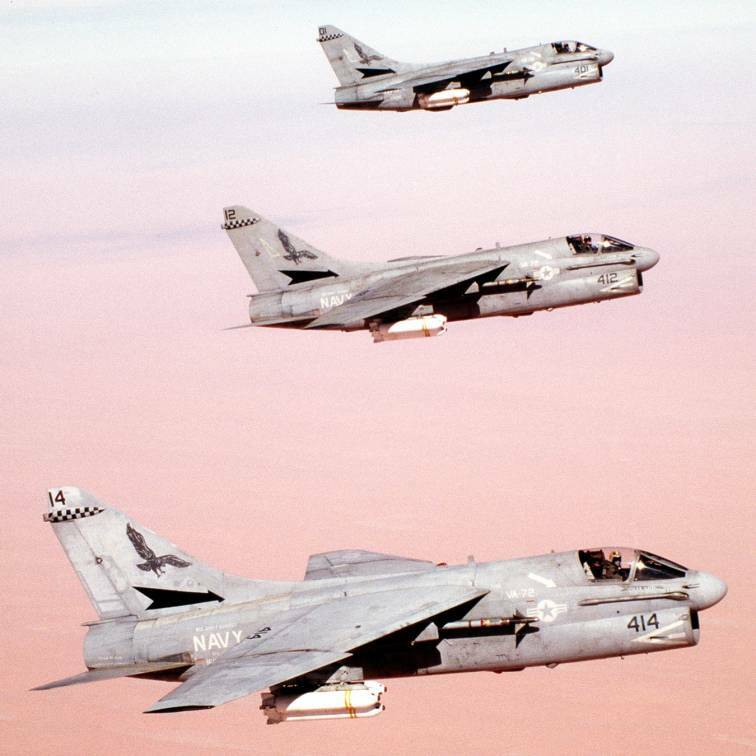 17 Jan 1991: Operation Desert Storm, combat operations to remove Iraqi forces from Kuwait, was launched. 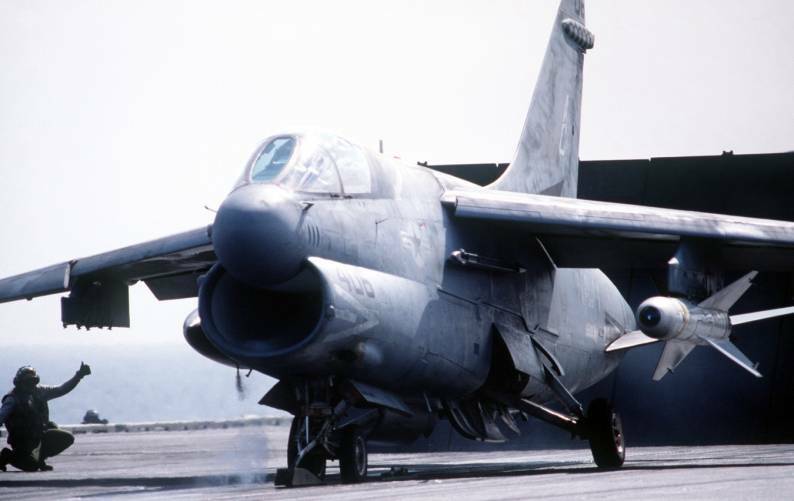 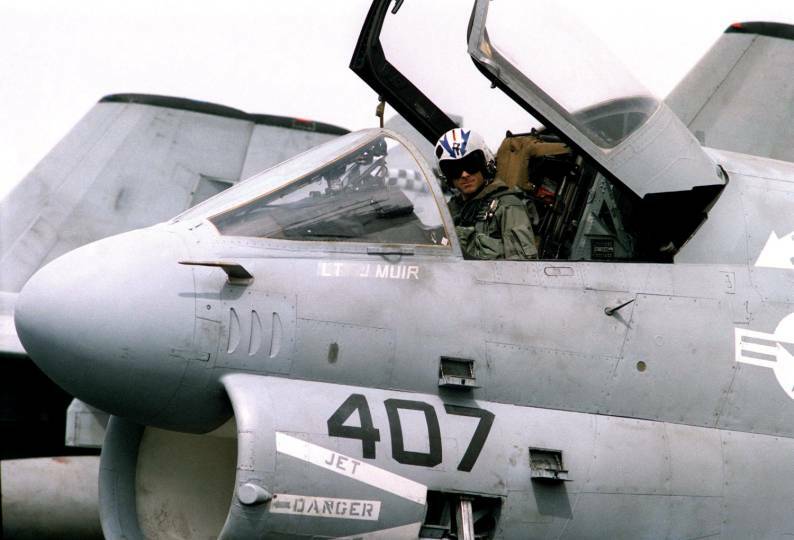 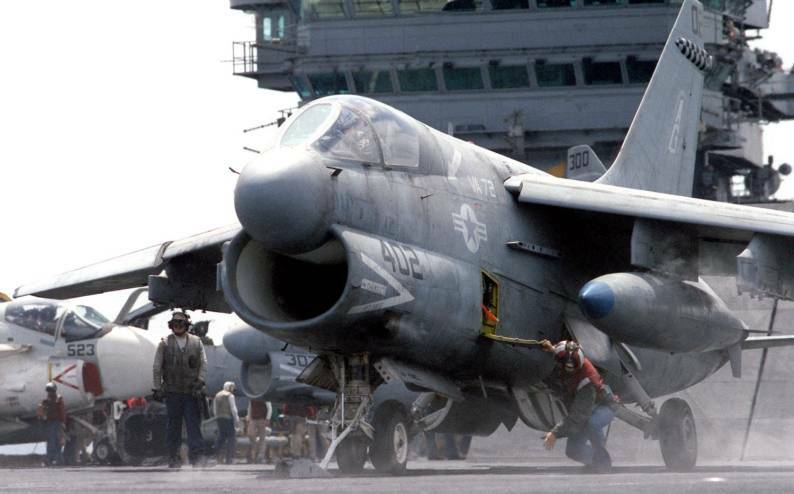 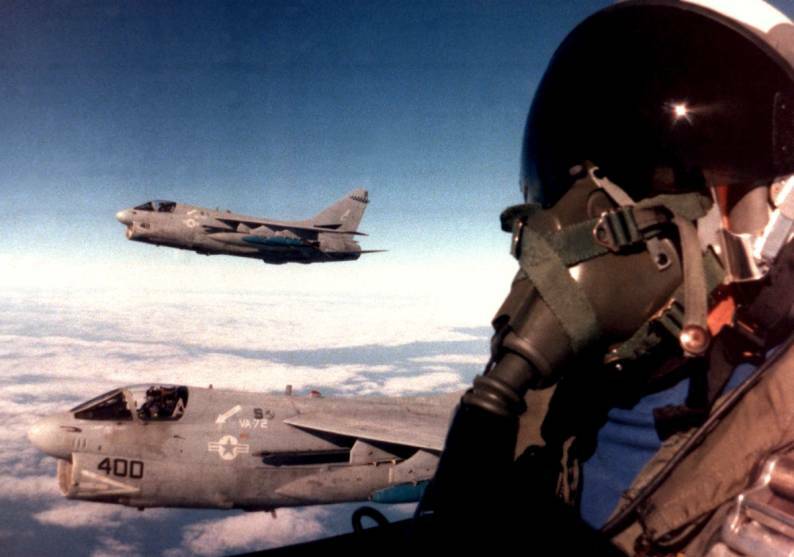 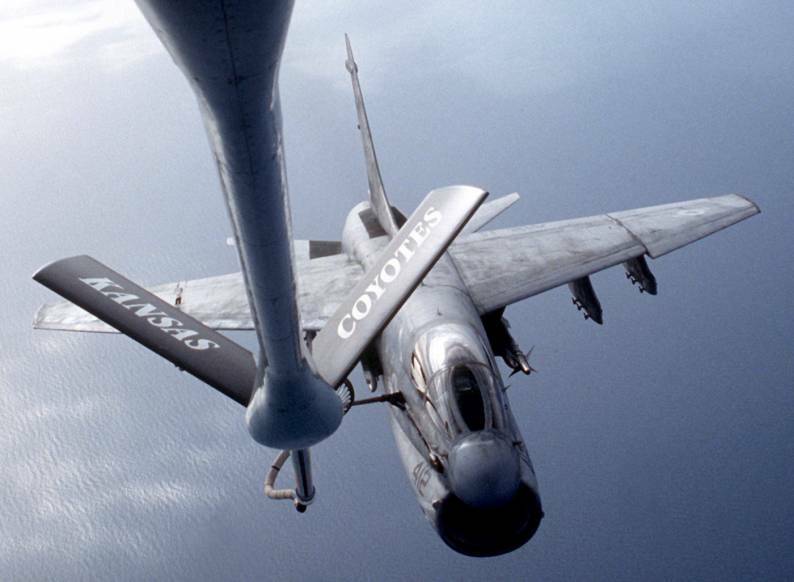 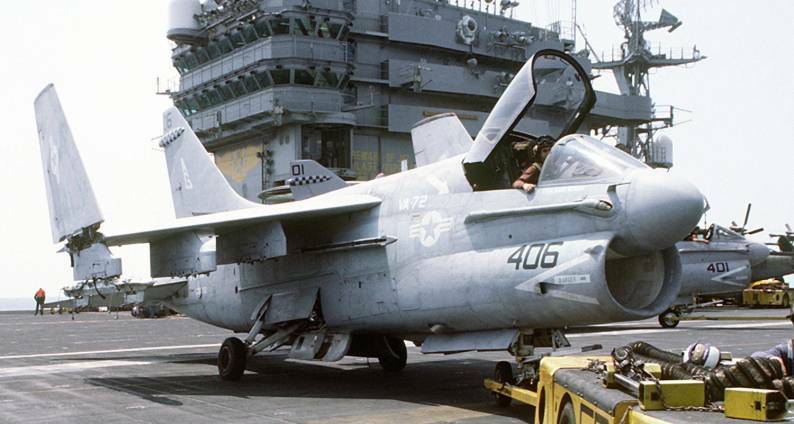 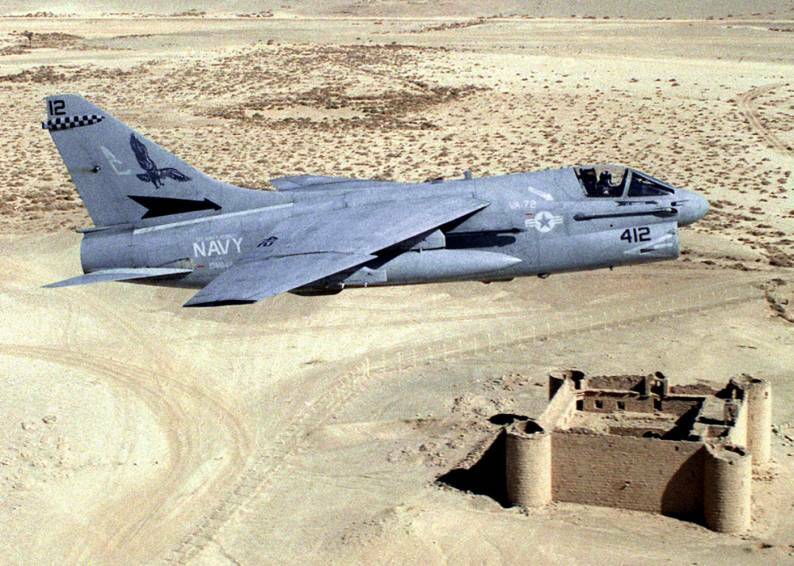 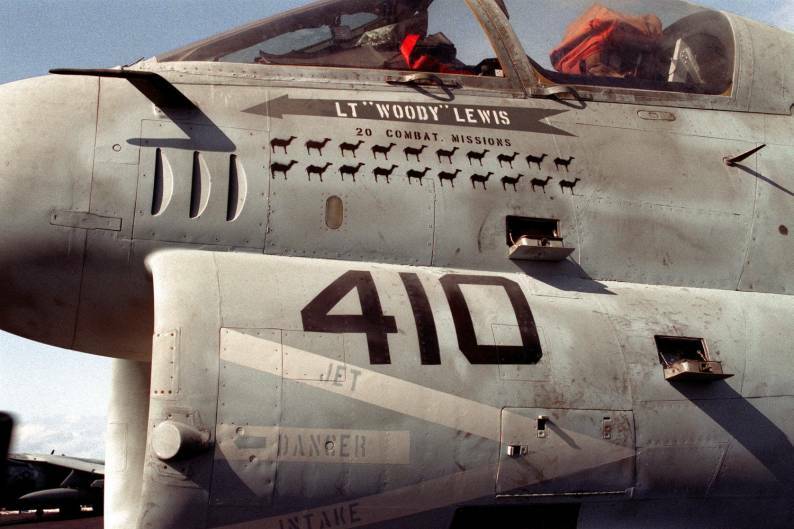 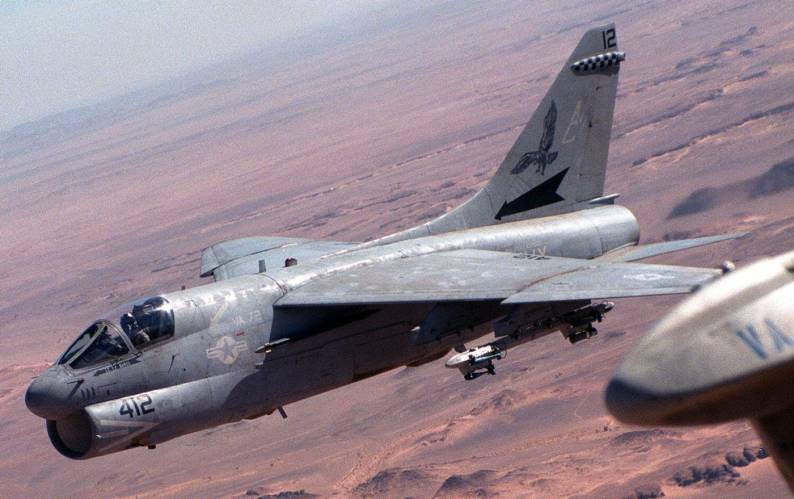 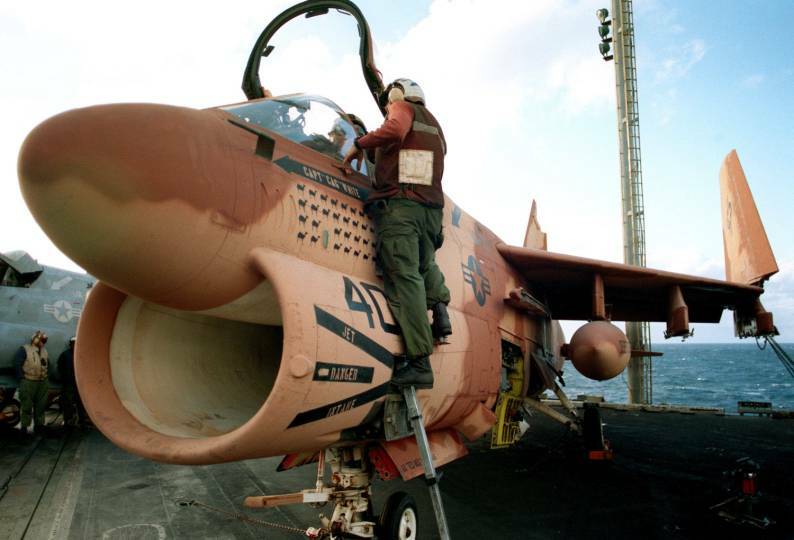 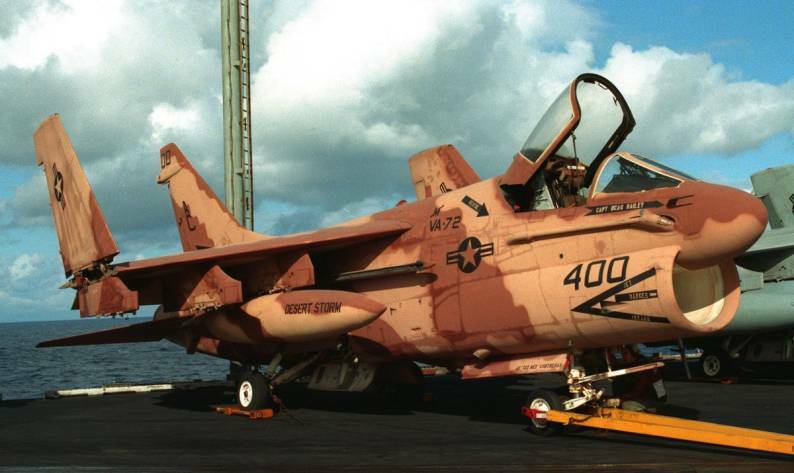 The squadron’s A-7E Corsair IIs participated in the first combat strike against Iraqi targets in Baghdad. 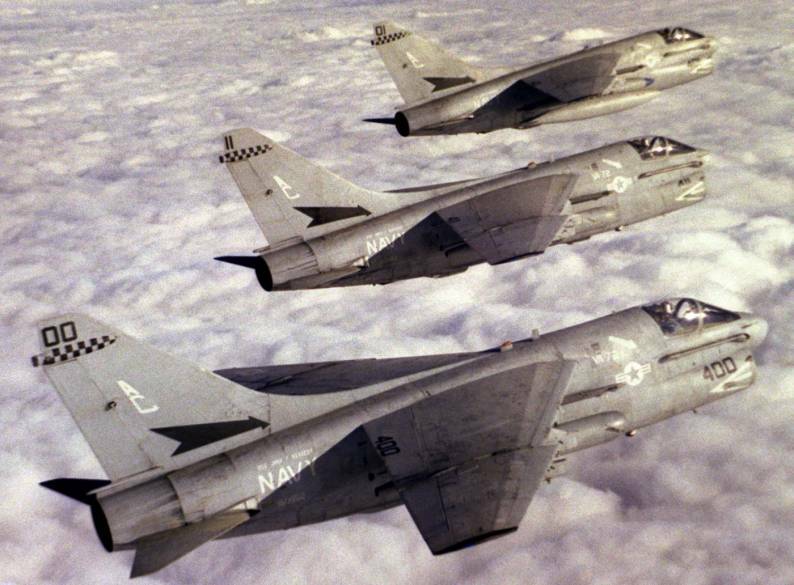 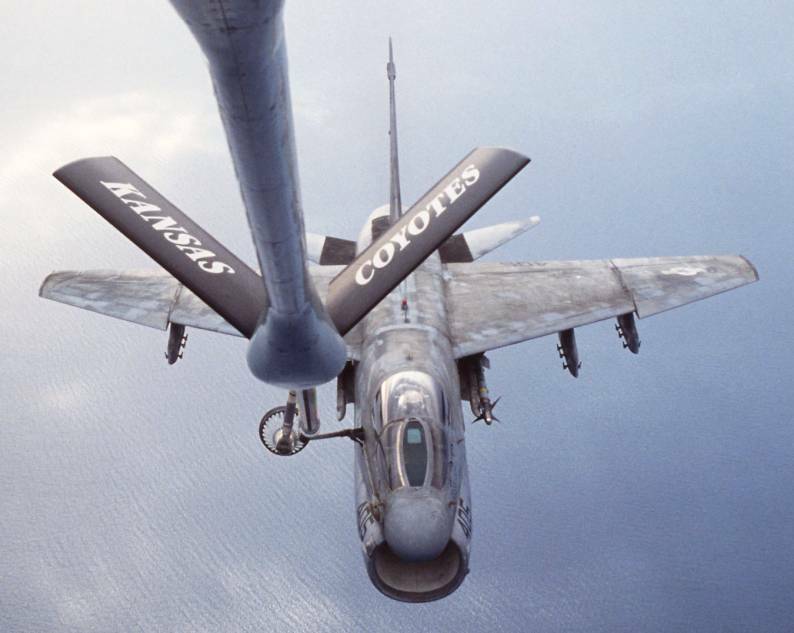 29 Jan 1991: Squadron aircraft flew their first combat mission in the Kuwait theater, striking Iraqi troops, tanks and artillery positions. 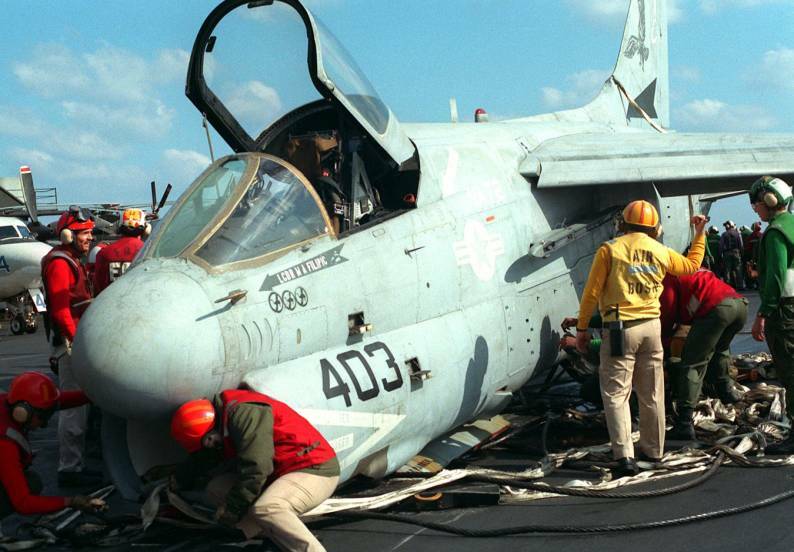 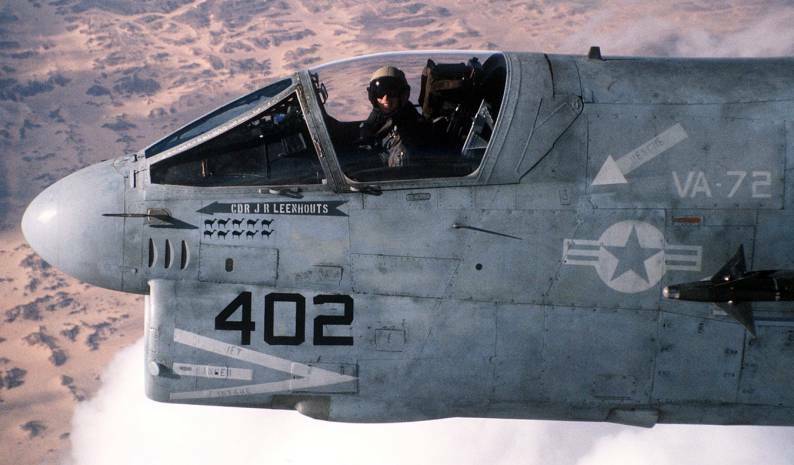 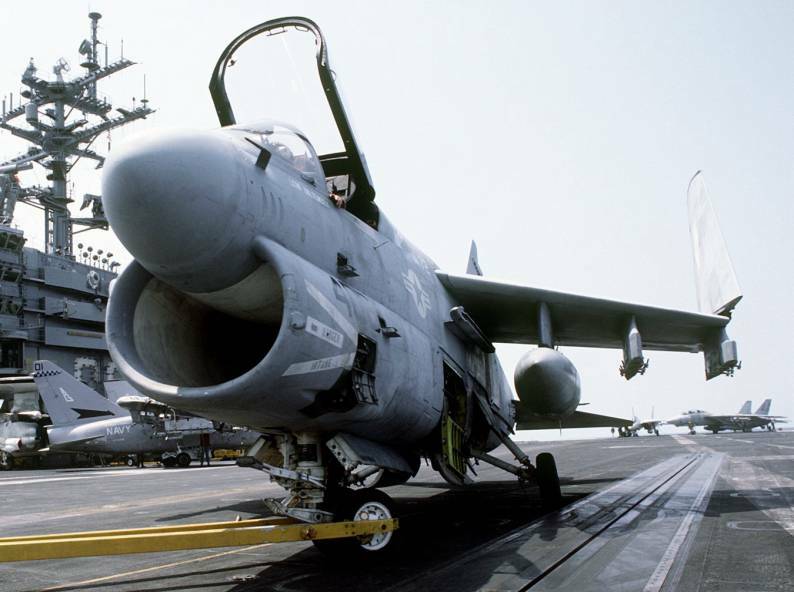 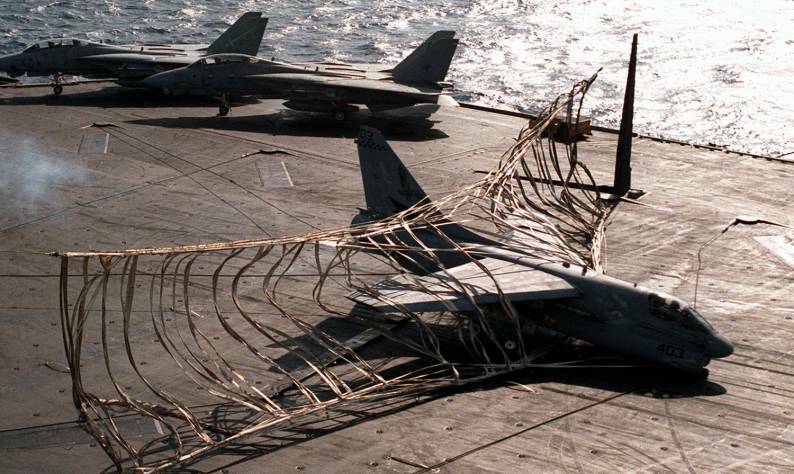 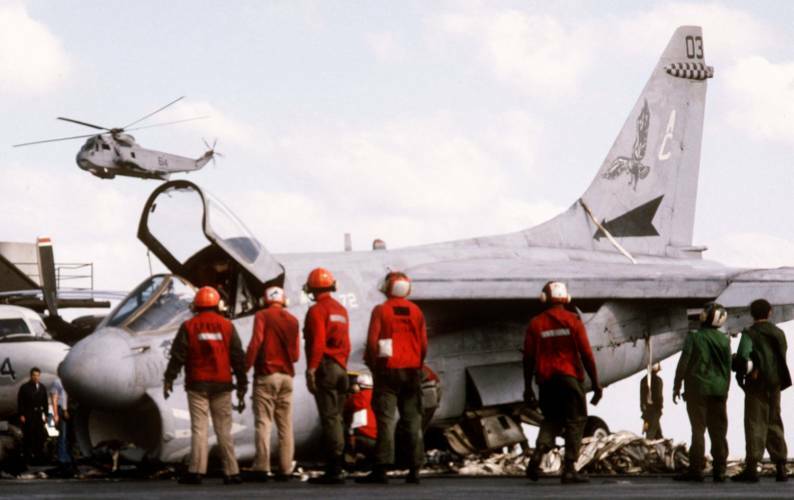 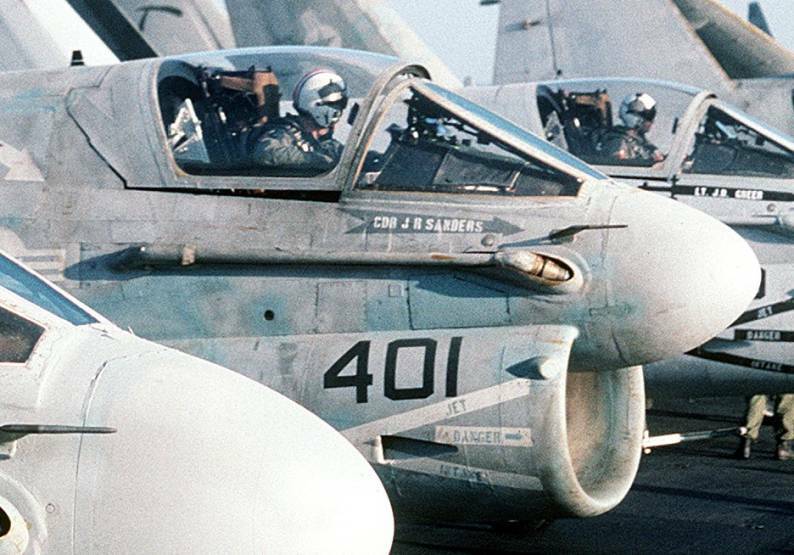 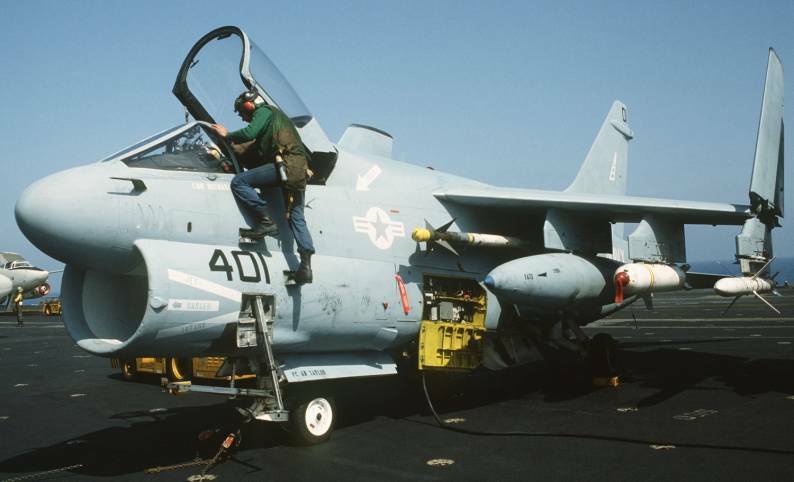 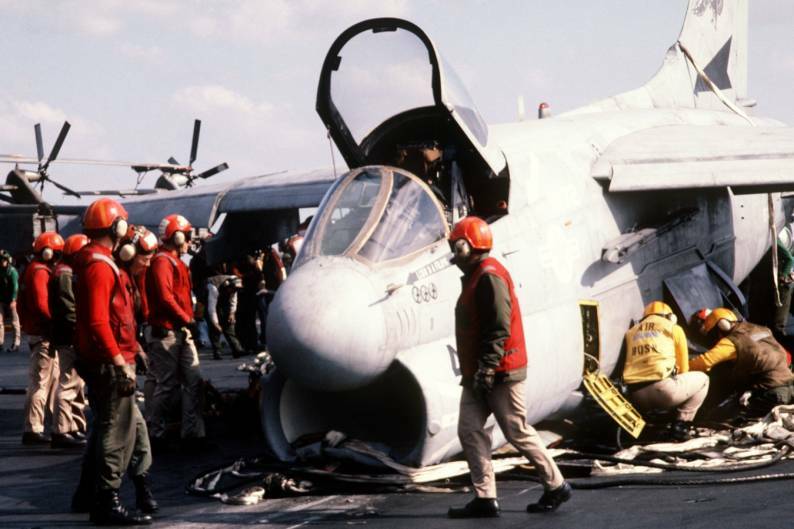 27 Feb 1991: Squadron aircraft participated in the last naval air combat strike of the war, hitting retreating Iraqi troops east of Najaf, Iraq. 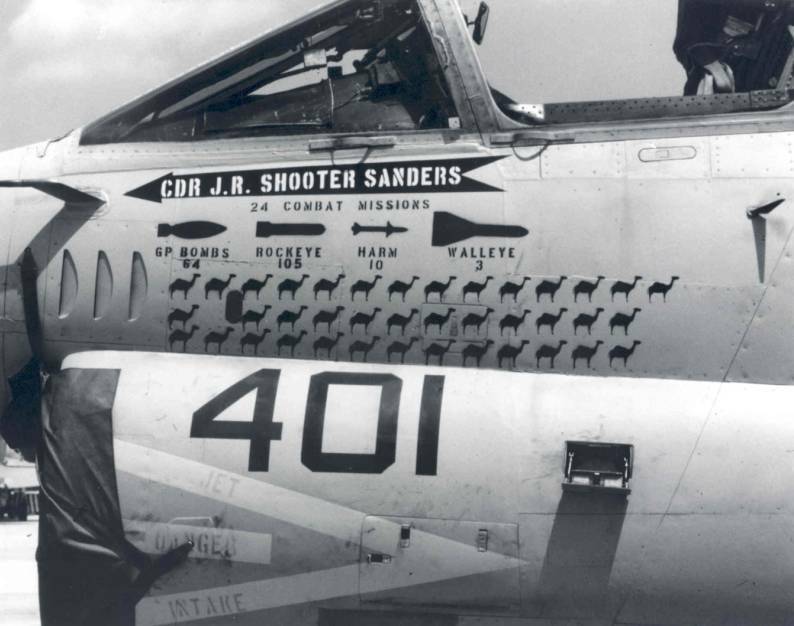 During the 43 days of war the squadron flew 362 sorties without the loss of a pilot or aircraft. 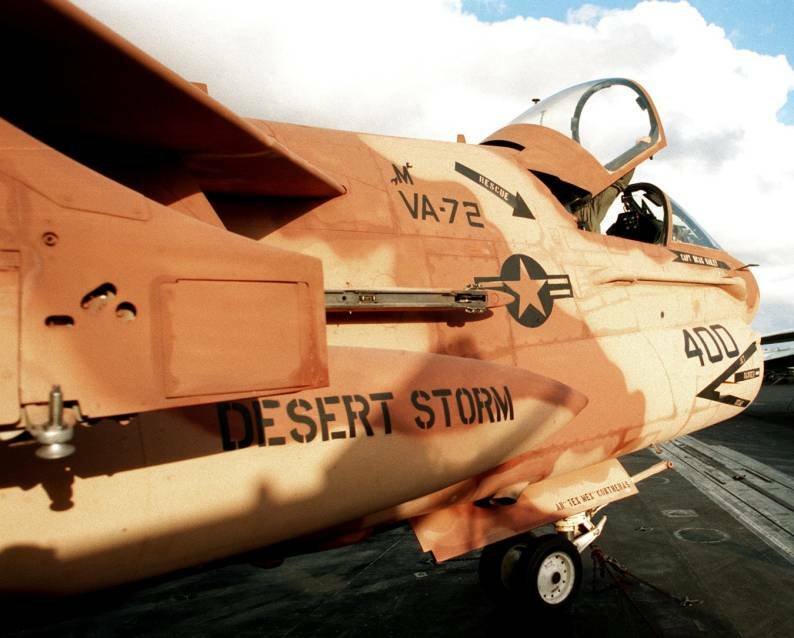 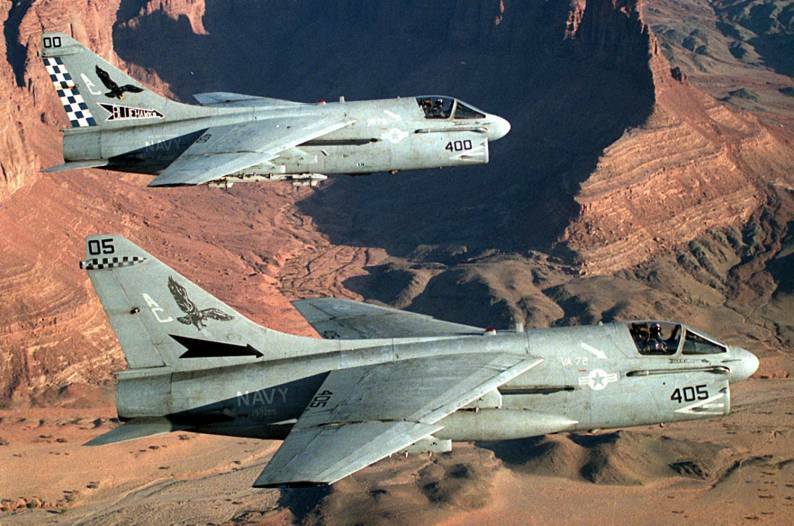 8 Jun 1991: The last two squadron aircraft participated in the Desert Storm Victory Parade flyover in Washington, D.C.